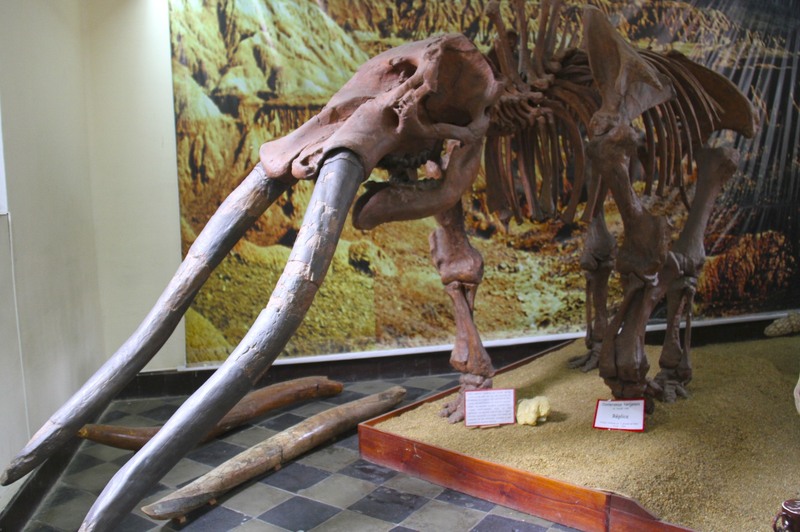 If Tarija is famed for its Mediterranean climate and its vineyards, it is also famous throughout Bolivia as being a region rich in pre-historic sites filled with fossils and whole skeletons of dinosaurs and ancient mammals. 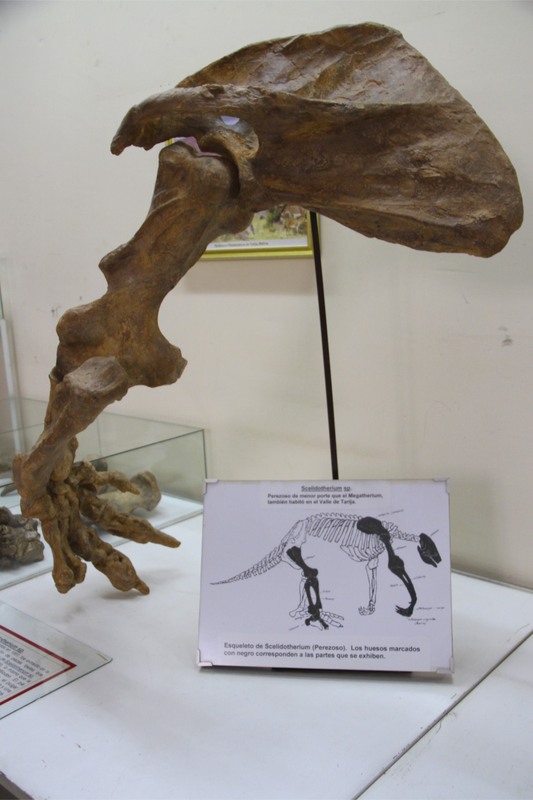 There are areas just outside Tarija literally littered with fossils, and some of the best finds from the region are now on display in Tarija’s Archaeology and Paleontology Museum. 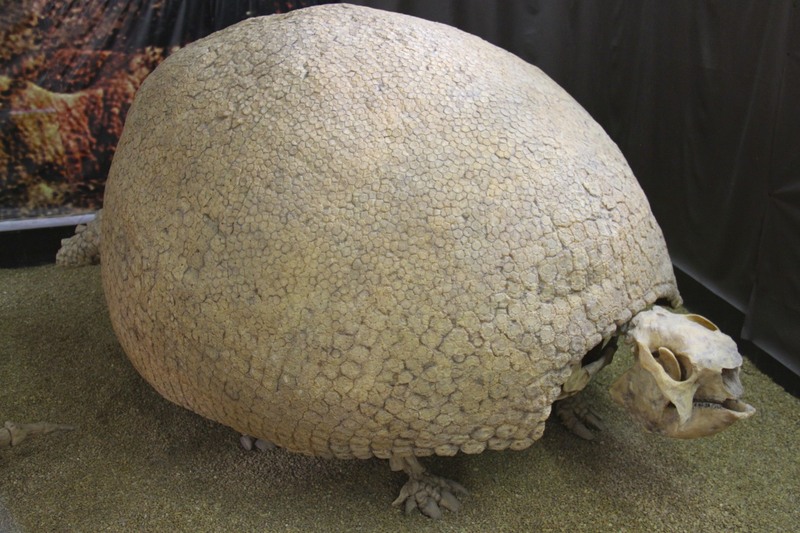 The museum isn’t very large, it only takes 30 minutes or so to visit, but you can get up close and personal with the region’s pre-history – and it’s free. 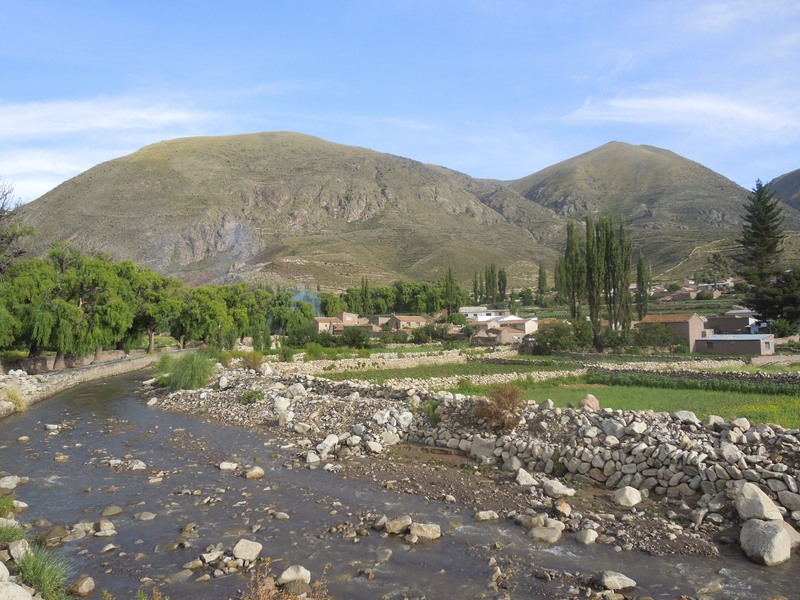 At the end of the long and verdant Cayara Valley lies the tiny village of the same name. 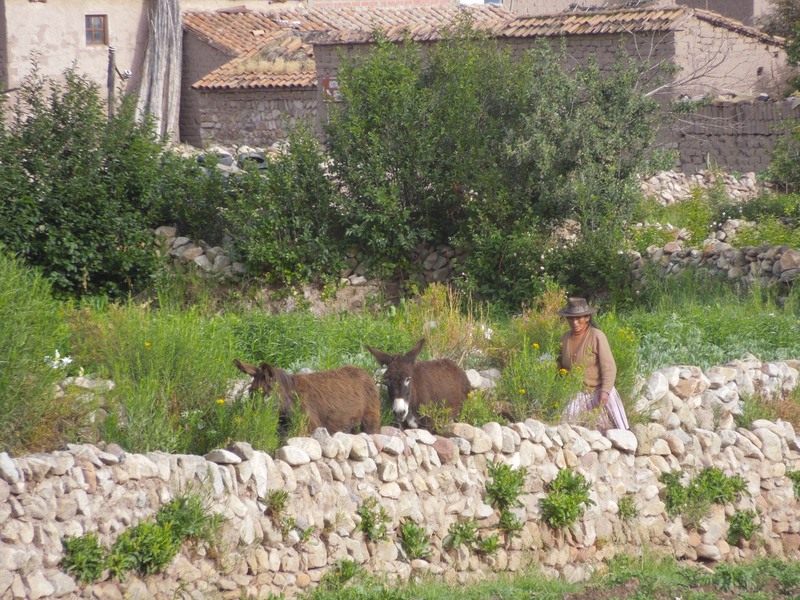 It looks like any ordinary Bolivian village: red tiles in the Spanish fashion sit atop adobe houses nestled into hillsides; braying donkeys occasionally breach the peace as they’re pursued by old ladies wearing colourful clothes; men and women tend their crops in the surrounding fields; and there is an all pervasive sense of timelessness about the whole place. For me timelessness has a double meaning in Cayara. When you are there it is as if time has been suspended, as if the world of the valley sits on a different plain of reality, isolating you from the madness of the world outside its borders; and then there is the Museo Hacienda Cayara, a hacienda dating back to the earliest phase of the Spanish conquest of the Bolivian part of the Inca empire. 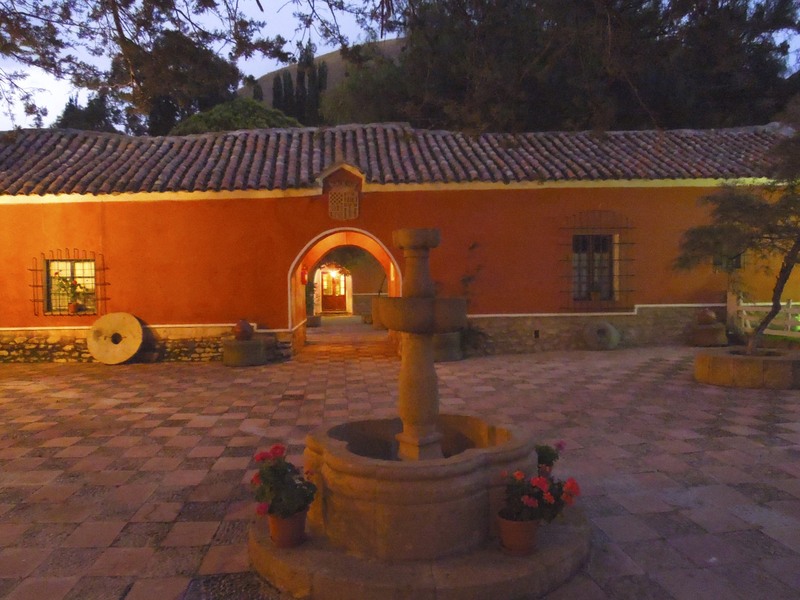 The hacienda is tucked away at one end of the village, hidden from sight by the surrounding hills and trees, so that when you approach its gates it is as if something ancient and secret is being revealed for the first time. 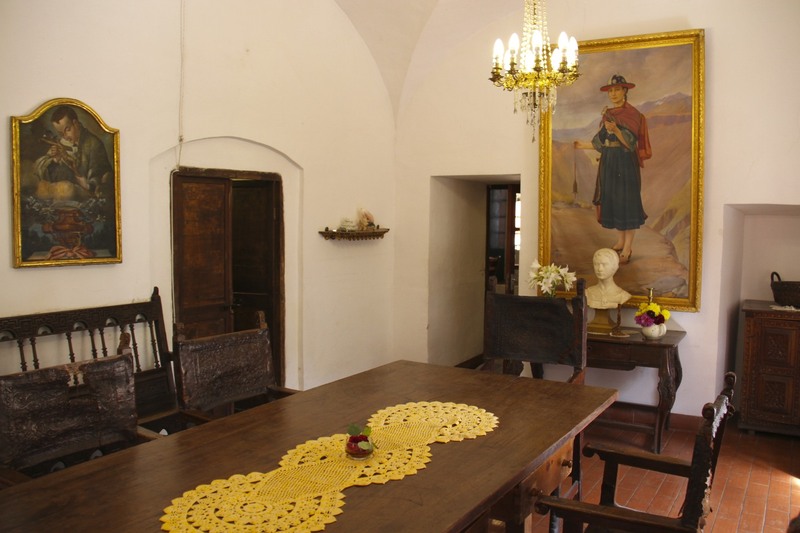 Founded in 1557 in a region the Spanish had renamed New Toledo, the hacienda literally drips with history, and it has been the home to Spanish nobility and refuge to pioneers of Bolivia’s independence. 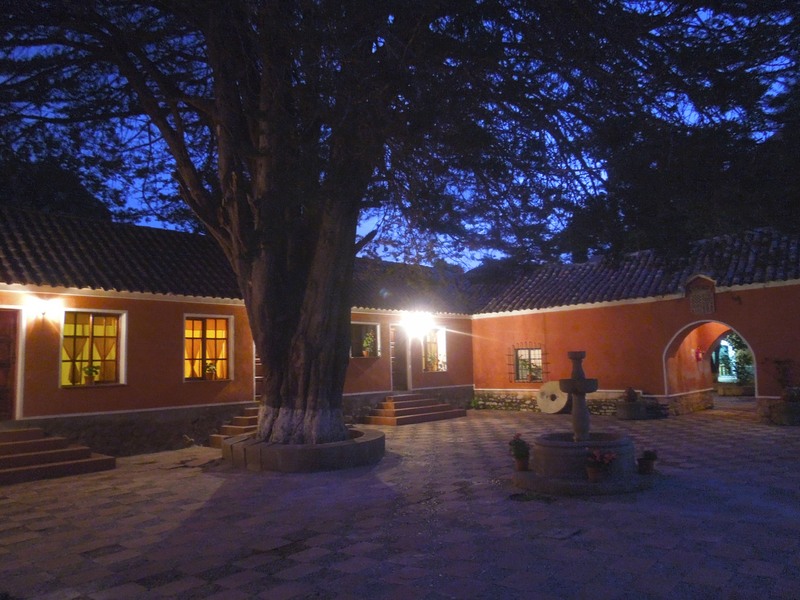 Today it has been completed renovated and transformed by the current owner into a hotel, which is a description that doesn’t do the hacienda justice. 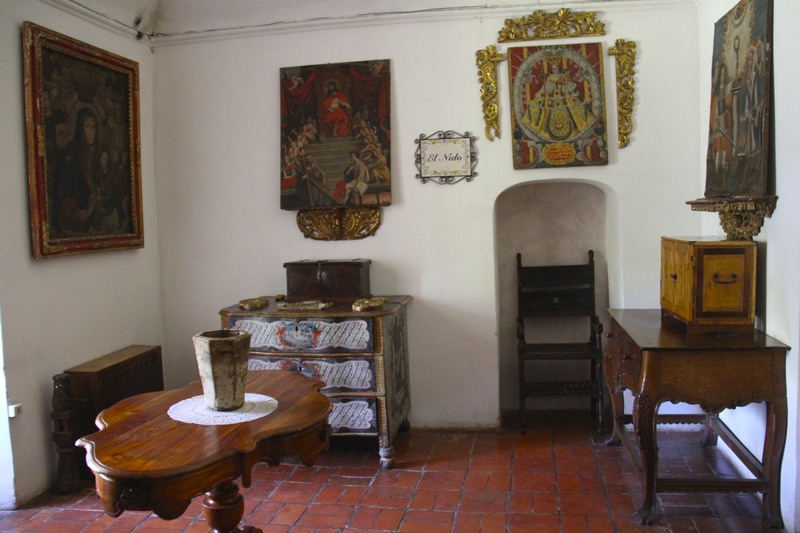 It is a living museum, but there is also a museum in the building with items from colonial times through to the present. 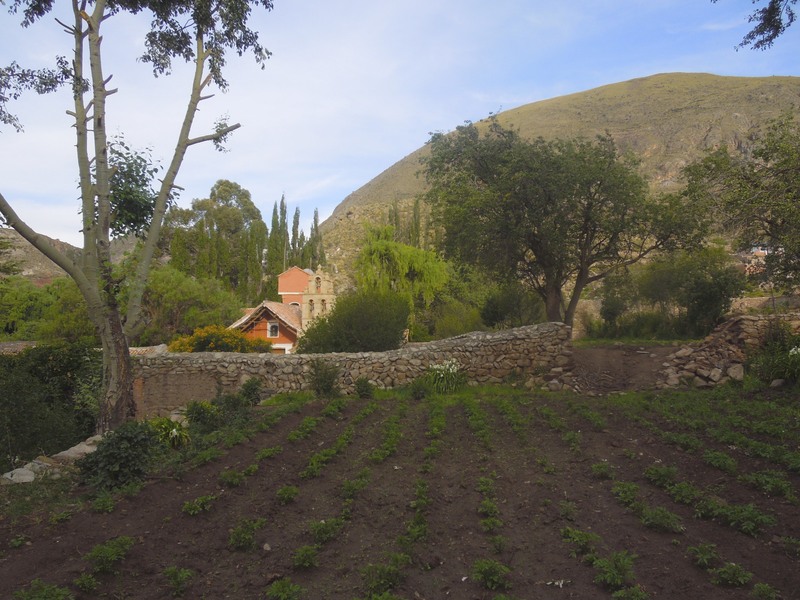 There are beautiful gardens and grounds, the hacienda has its own farm, including a dairy farm, providing fresh produce for all meals, and I doubt there is a more welcoming place to stay in the whole of Bolivia. 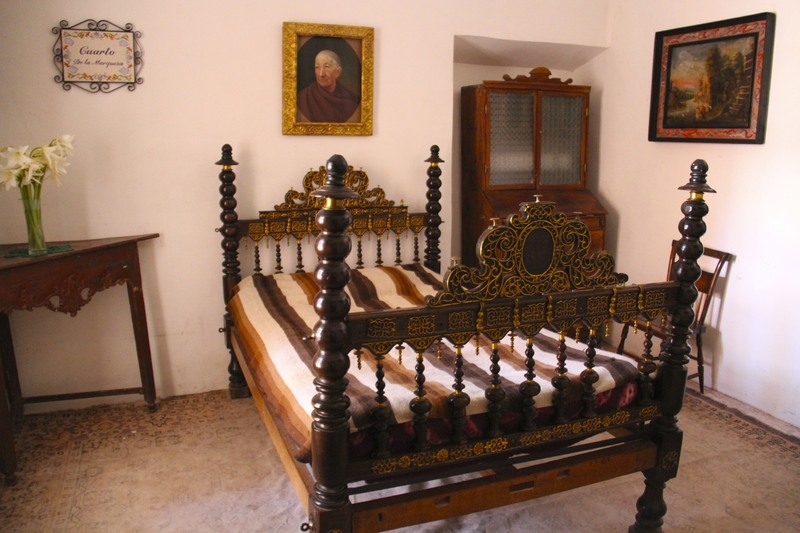 Inside, the hacienda is decorated with original paintings, furniture, light fittings and pre- and post-hispanic artworks and artefacts. 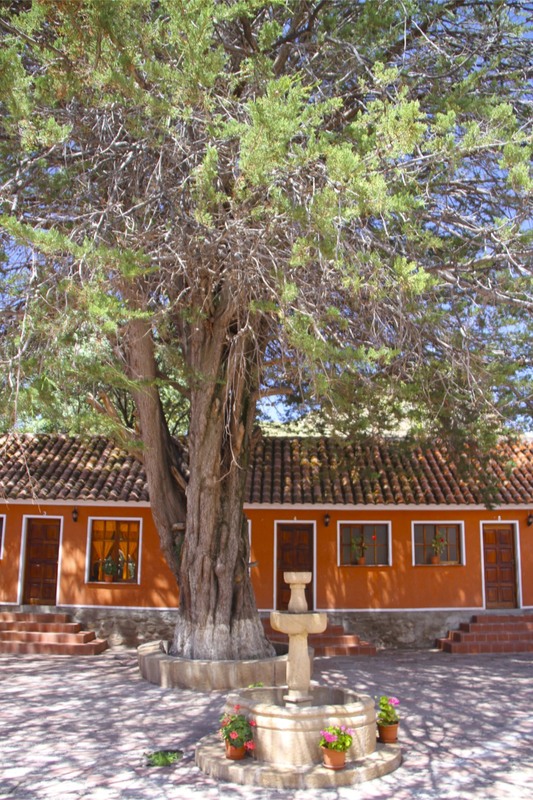 It is a treasure trove of Bolivian history, there are even two libraries containing books dating back to the 17th Century. It is a privilege to be able to wander through the house. 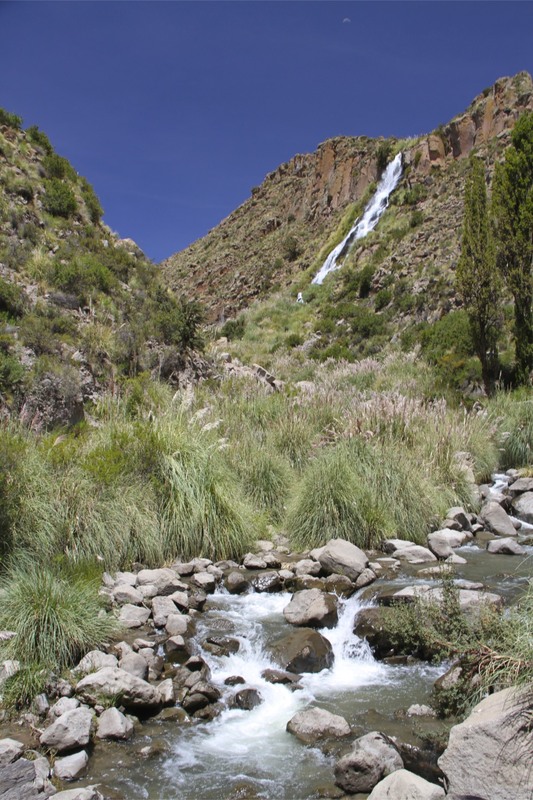 As well as providing excellent walking opportunities in the valley or to nearby villages, just a short walk behind the hacienda is a beautiful waterfall that also give an indication of why this valley is so green – water is year-round in the valley, appearing from a underground source above the valley and then plunging down its cliffs to the the valley floor. 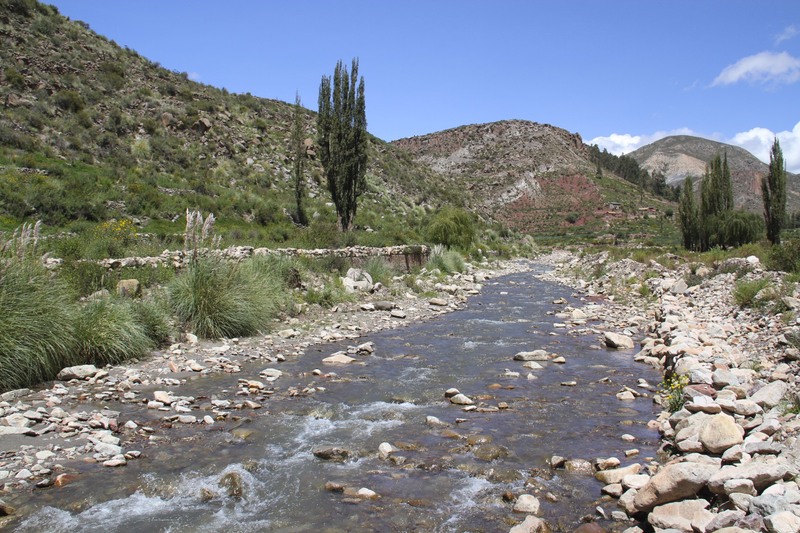 The power of the water has been harnessed to provide hydroelectric power to the entire valley. 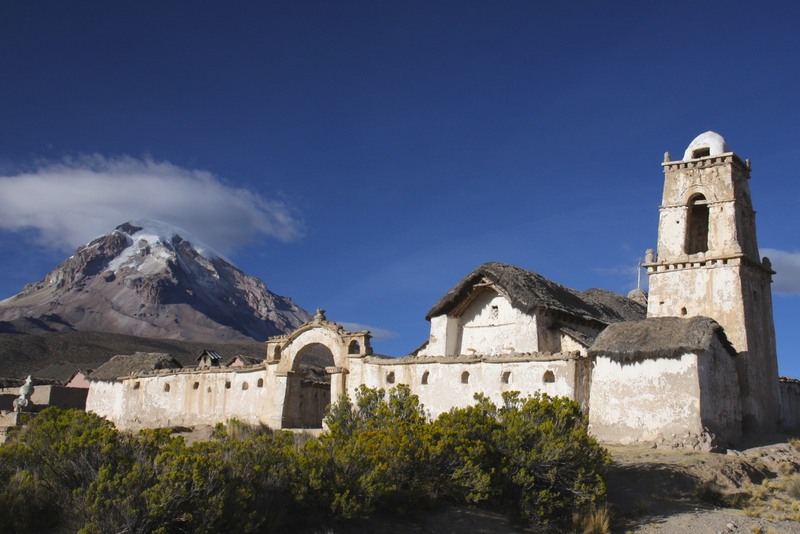 The Casa Nacional de la Moneda de Bolivia in Potosi is an imposing building. 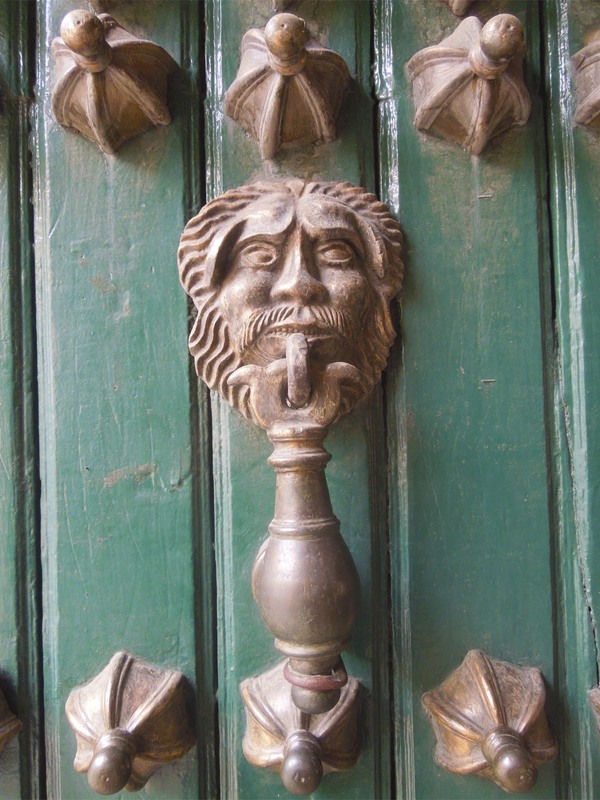 From the moment you see the huge wooden doors, complete with large metal studs, you know it is anything but ordinary. 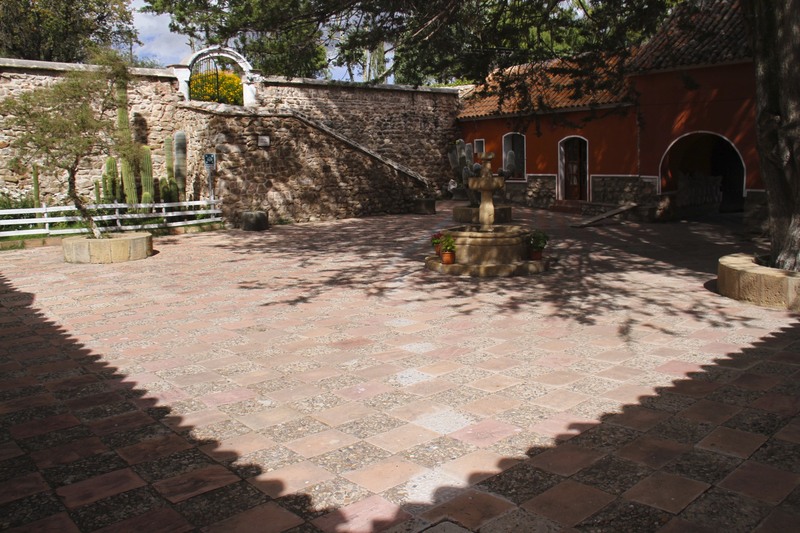 The whole building is constructed like a fortress, for this was the mint established by the Spanish to process the silver they were ripping out of the mines in the Cerro Rico (Rich Mountain). 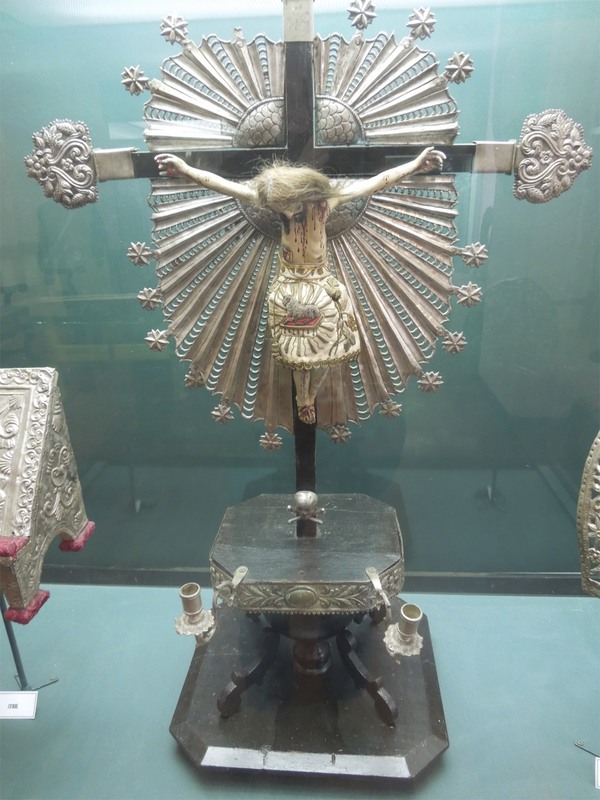 Silver which made Potosi famous and Spain rich. 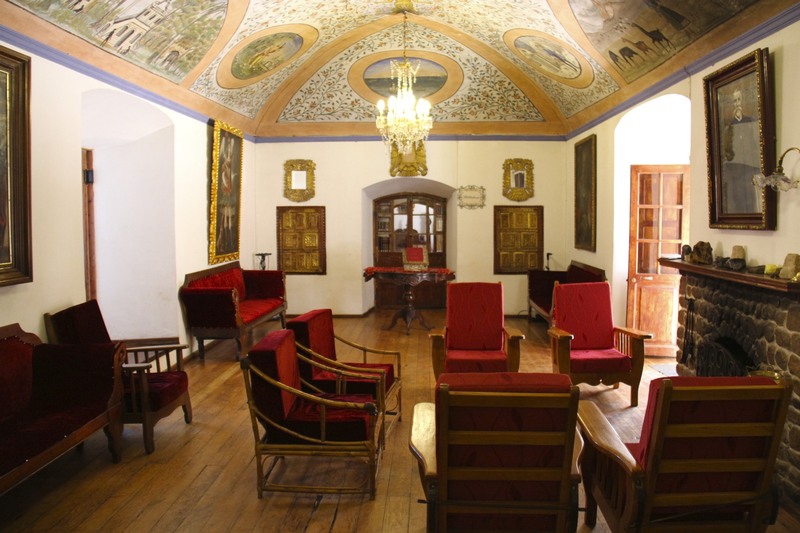 Founded in 1759 to replace to the original sixteenth-century mint, the Casa de la Moneda continued to function as a mint until 1951. 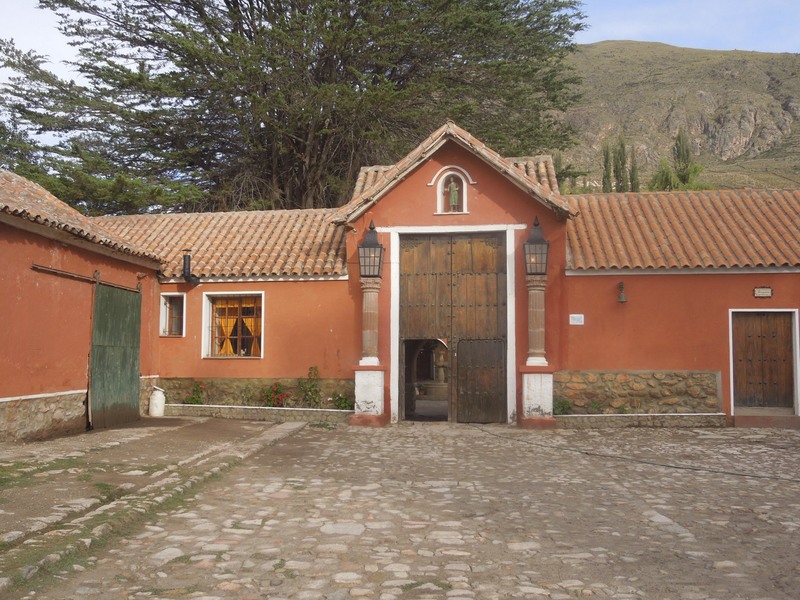 Today it is an excellent museum telling the story of the mint and, more poignantly, the history of the destructive force of Spanish greed on the peoples of the Andes. 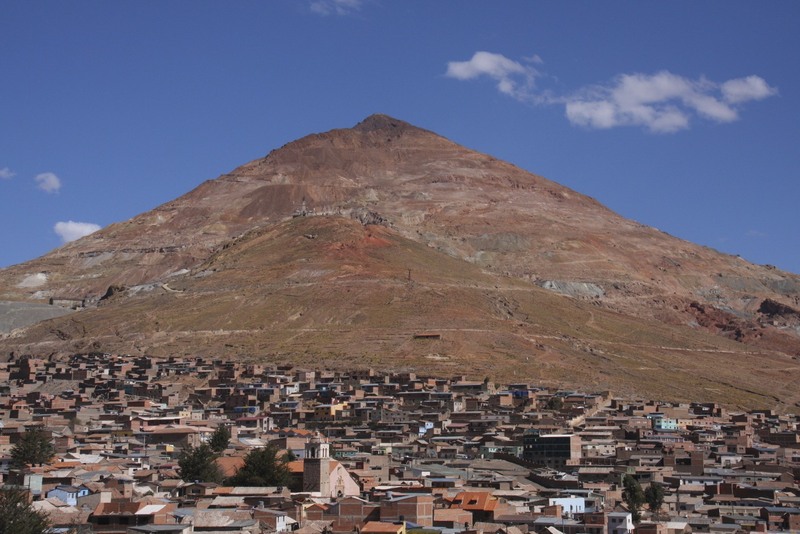 Potosi held the largest silver deposits in the known world, and its discovery in the 1540’s was a godsend for the Spanish and an unmitigated disaster for the entire Andean highlands. 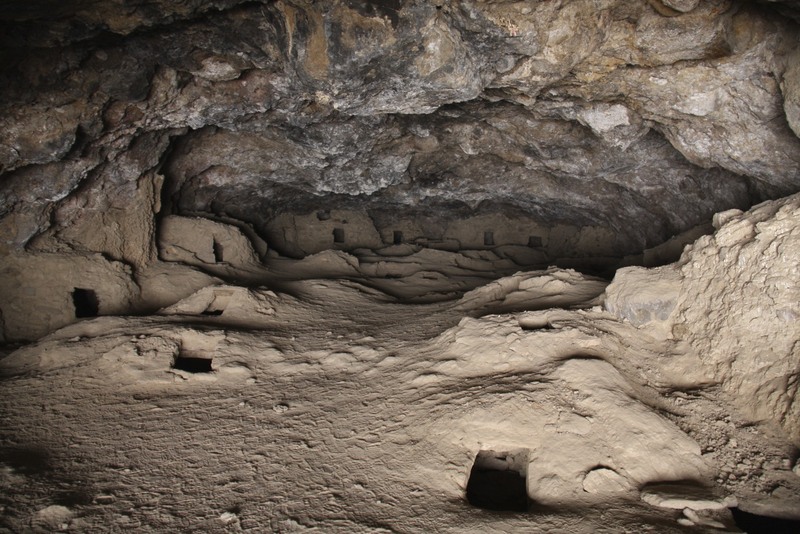 The wealth of the silver mines in Potosi was legendary in sixteenth- and seventeenth-century Europe, so much so that the saying ‘to be worth a Potosi’, meaning to be worth a fortune, was in common usage. 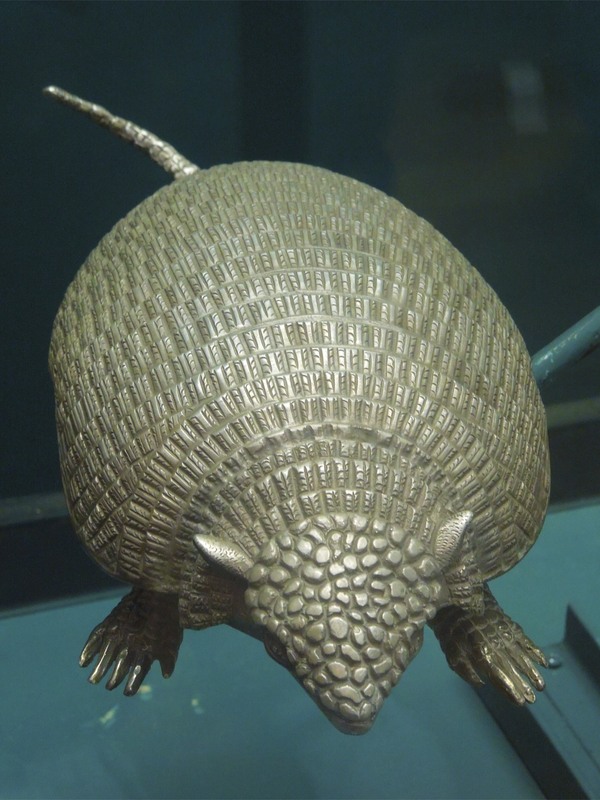 This was the silver the Spanish shipped across the Atlantic from the equally legendary Spanish Maine, where English privateers (pirates) in the employ of the English Crown preyed upon Spanish silver galleons. 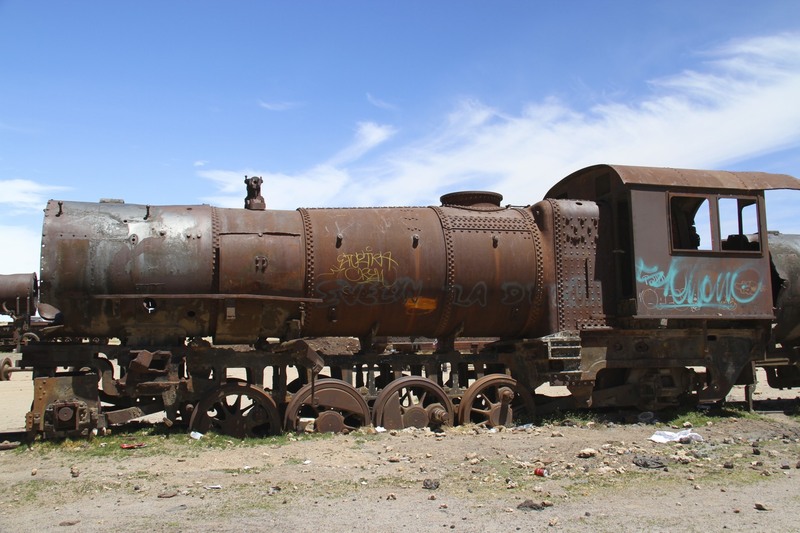 While that part of the history of Potosi is still being glamourised by Hollywood in the Pirates of the Caribbean franchise, there is a much darker and more terrible history that remains largely untold. 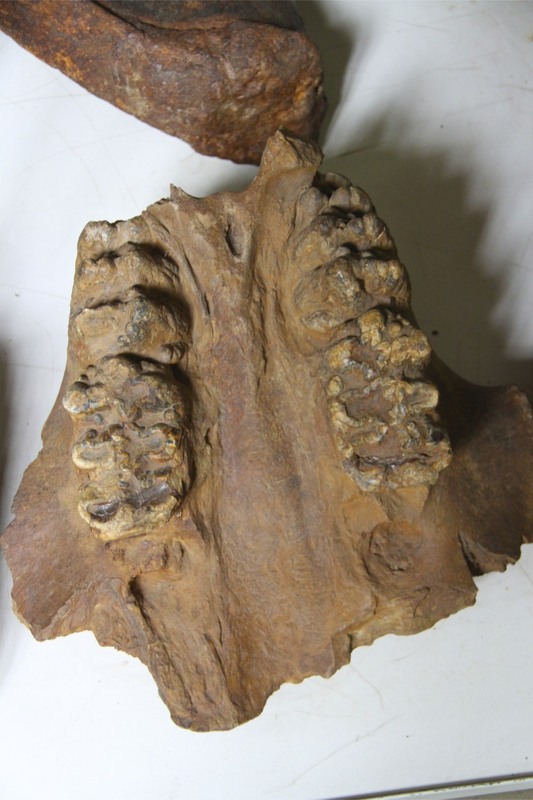 The Spanish Crown, mine owners and religious orders grew rich over the three hundred years which followed the discovery of silver in Potosi, but this came at a terrible price in human suffering. 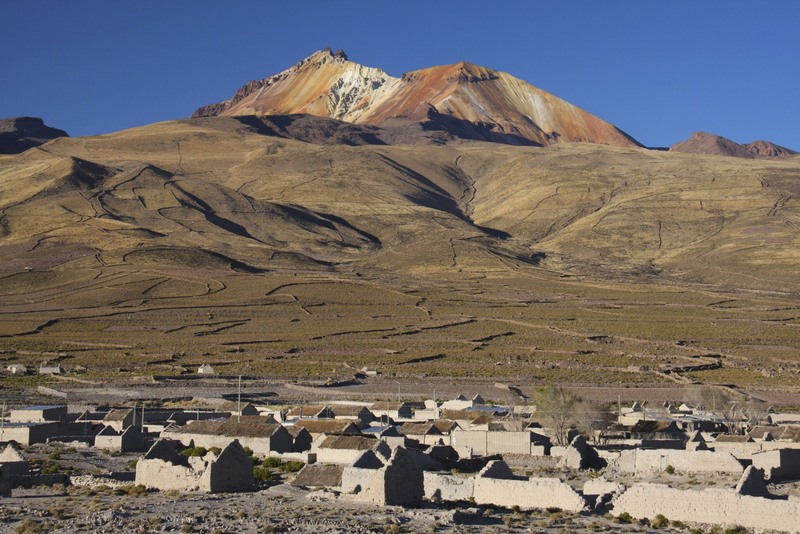 The Spanish authorities pressed millions of indigenous Andean peoples into slavery to work in the mines. 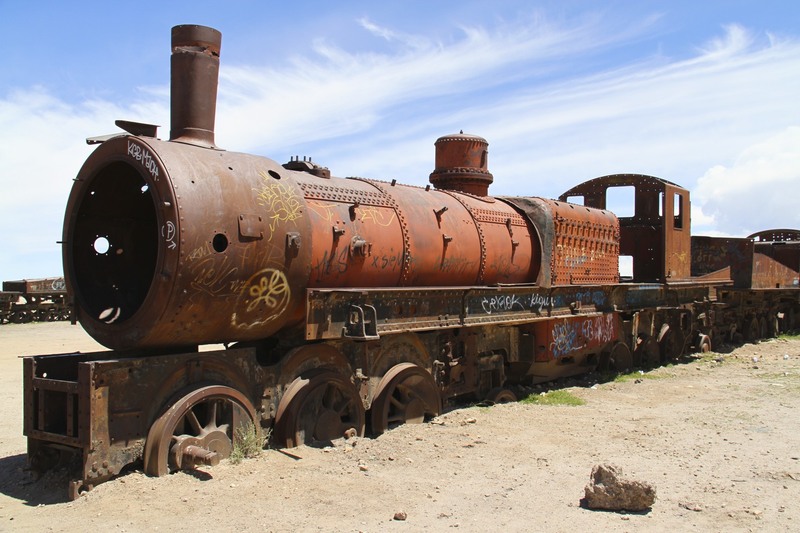 So deadly were the working conditions of the mines the Spanish were forced to ship African slaves to Potosi to supplement the rapidly dwindling workforce. 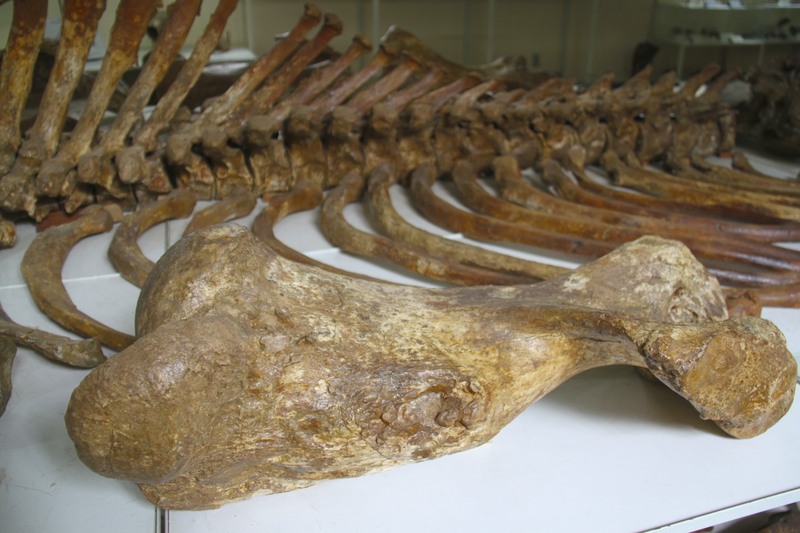 It is estimated that between eight and ten million people died in the appalling conditions in both silver and mercury mines or the processing industries. 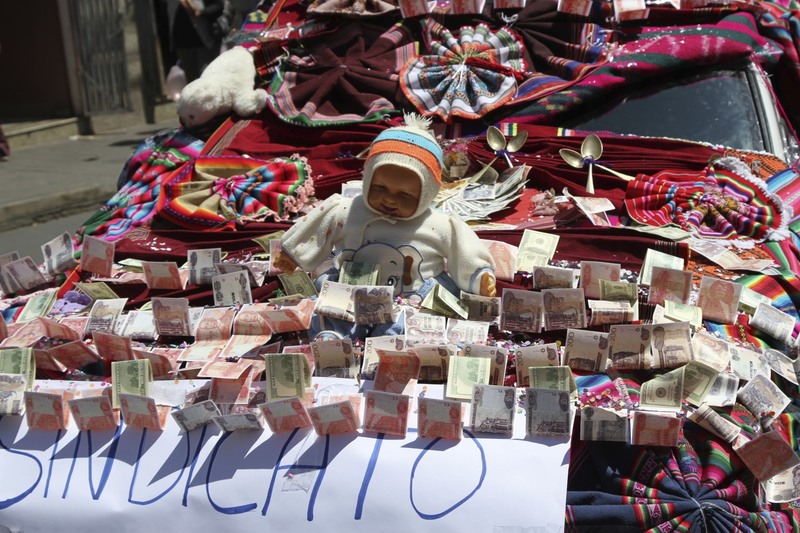 This genocide is as much the history of the Casa de la Moneda as the fascinating history of the mint itself. If the mines were deadly places to work, the mint itself wasn’t much better. 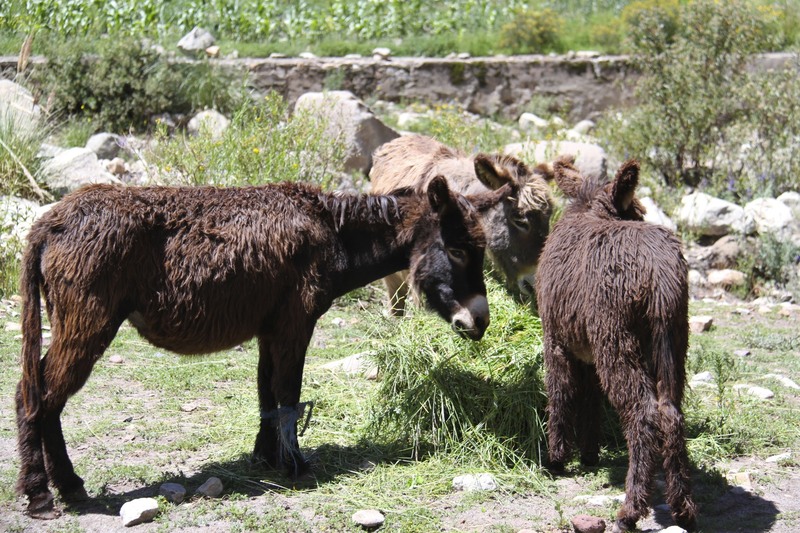 People and animals were worked to death: a donkey had a life expectancy of only three or four months once it arrived in the mint. 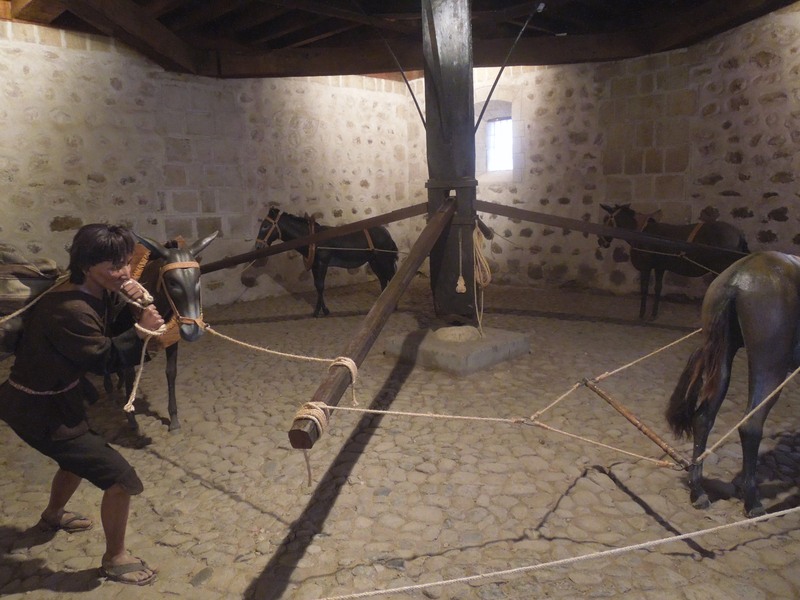 You can still see the marks in the floor where the donkeys walked endless circles powering the machines. 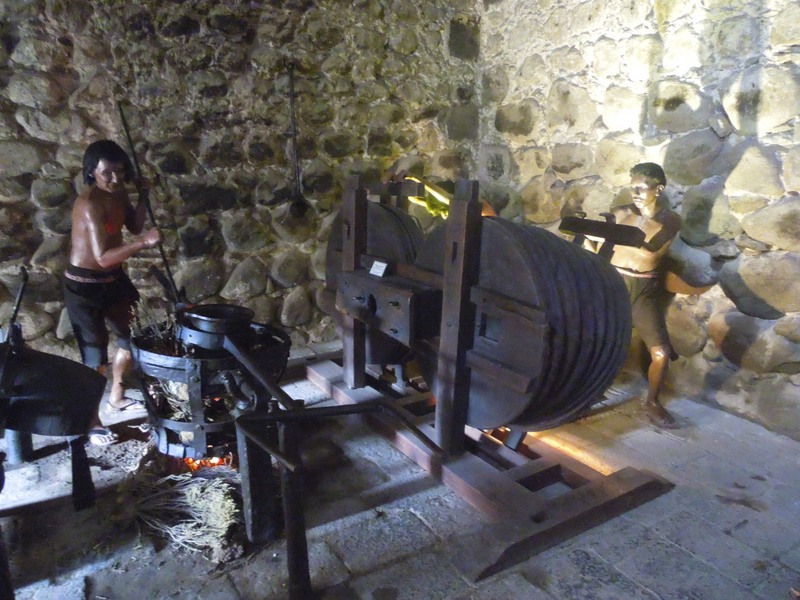 Today the museum also contains many original and copies of coins minted during colonial and Republican times. 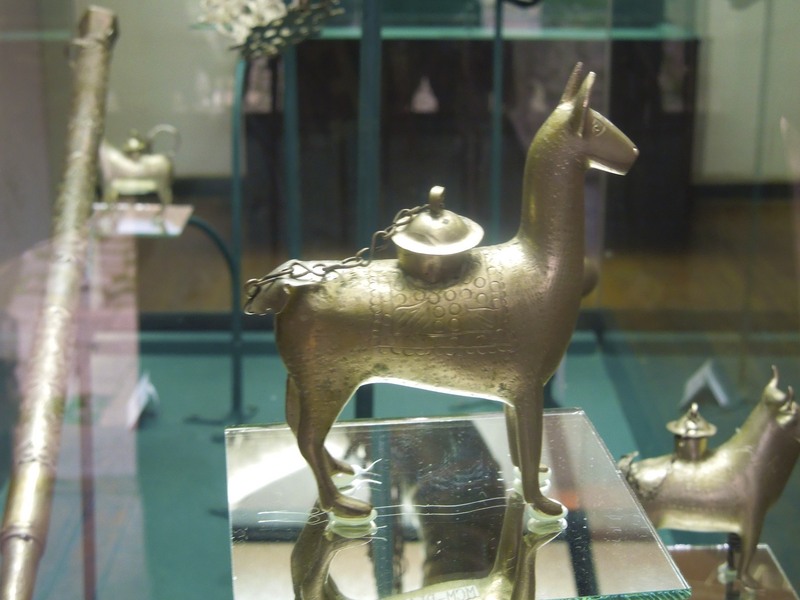 There are also numerous artworks and silver items that were created from the wealth of Potosi. 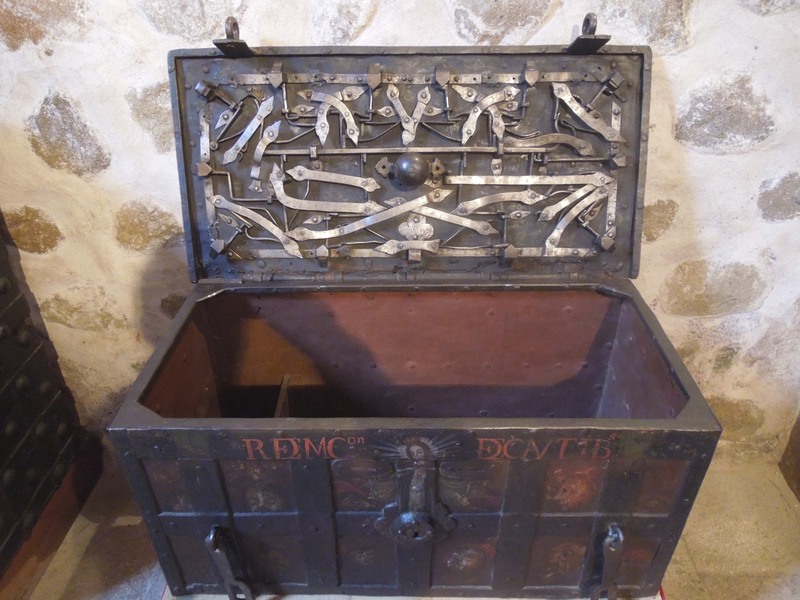 The museum also contains this amazing treasure chest which was used to ship silver to Spain. 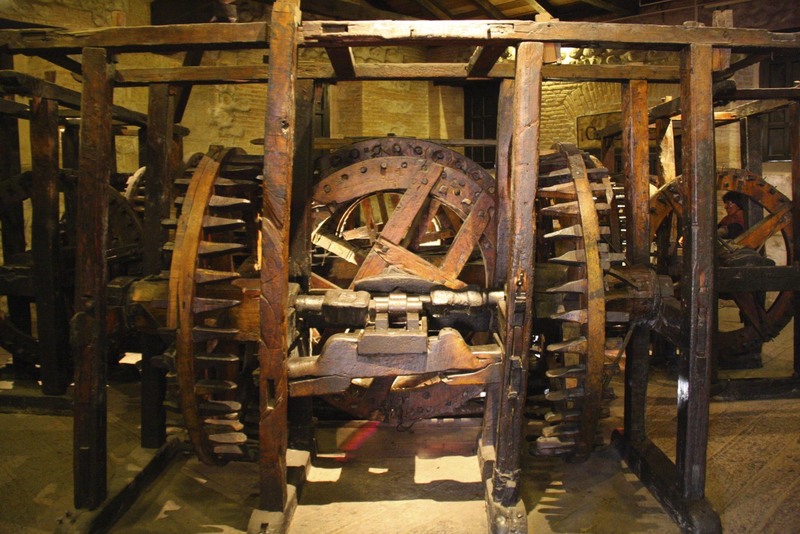 The elaborate locking mechanism was designed to frustrate anyone who stole the chest. 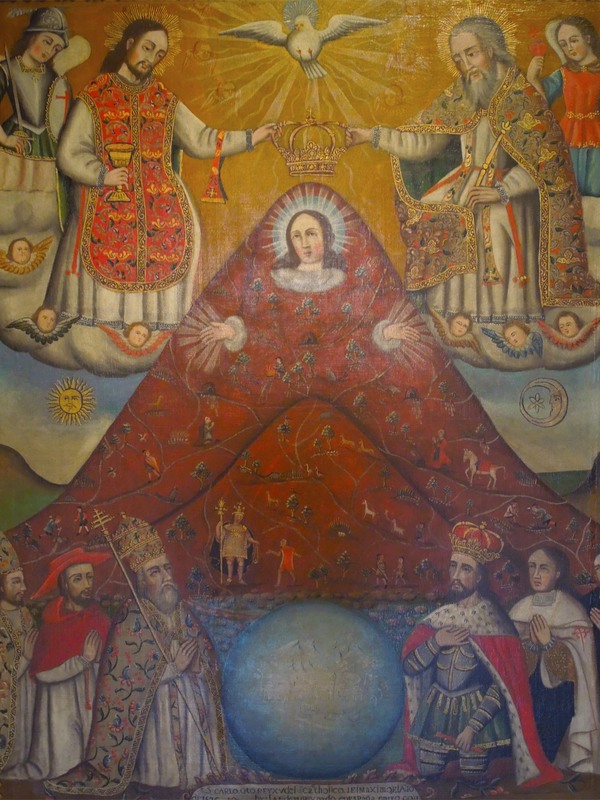 So important were the silver mines of the Cerro Rico that religious art reflected this by incorporating both Christian symbols and pre-conquest religious imagery into artworks – unmistakable in both of these paintings is the shape of the Cerro Rico. 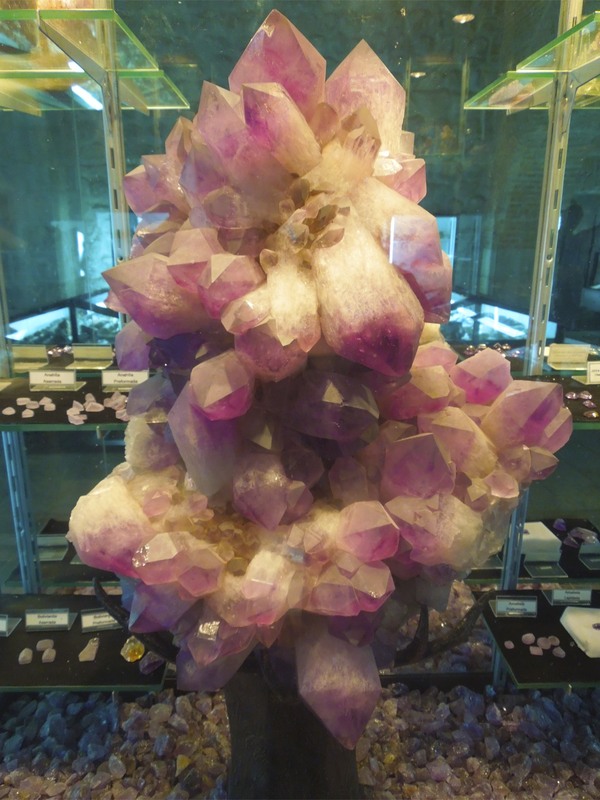 There is also a section of the museum given over to minerals, including this giant Bolivianite – a semi-precious stone of purple and yellow hues found only in Bolivia. 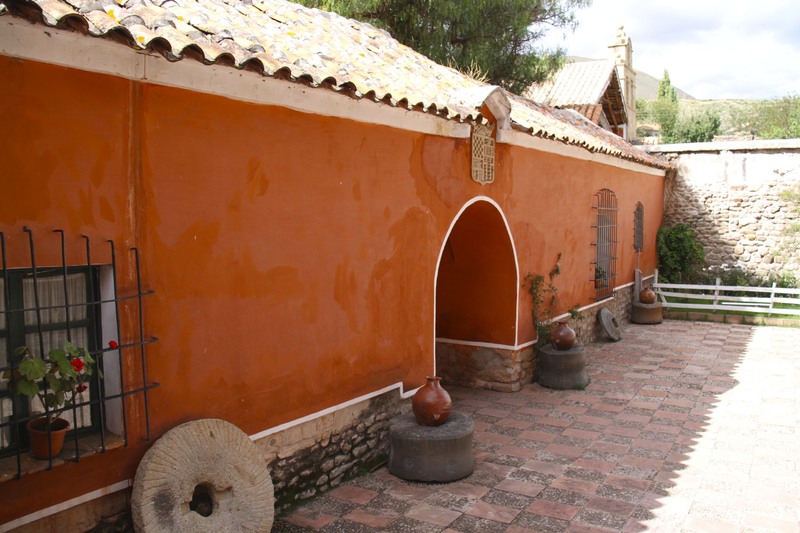 The museum is a must for anyone interested in the history of Bolivia, or wanting to know more about the colonisation of the region and its impact upon the indigenous population of the Andes, as well as the influence Potosi silver had in Europe. 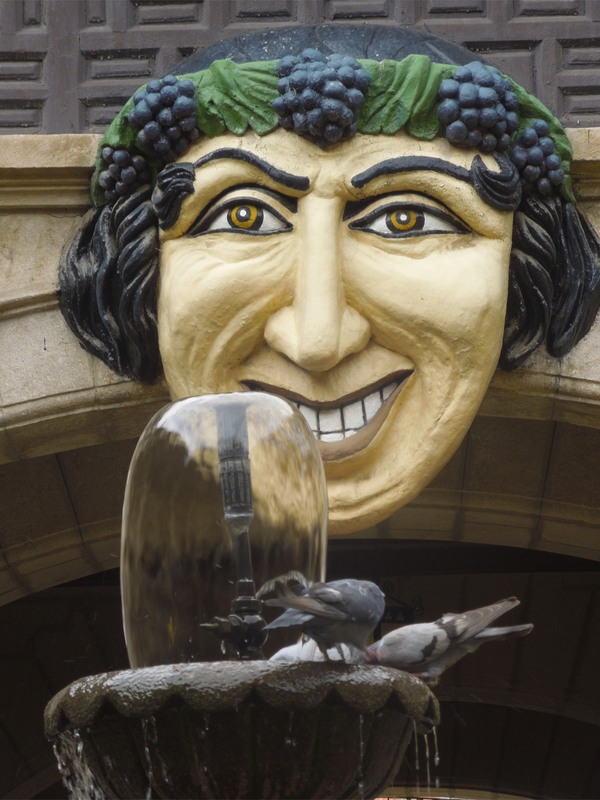 The one unexplained feature of the Casa de la Moneda is the odd looking sculpture that greets you on arrival: a giant grinning head surrounded by grapes called El Mascaron. While theories abound, no one other than Eugenio Moulon, the Frenchman who hung it there in 1865, really knows what its true meaning is…answers on a postcard please. 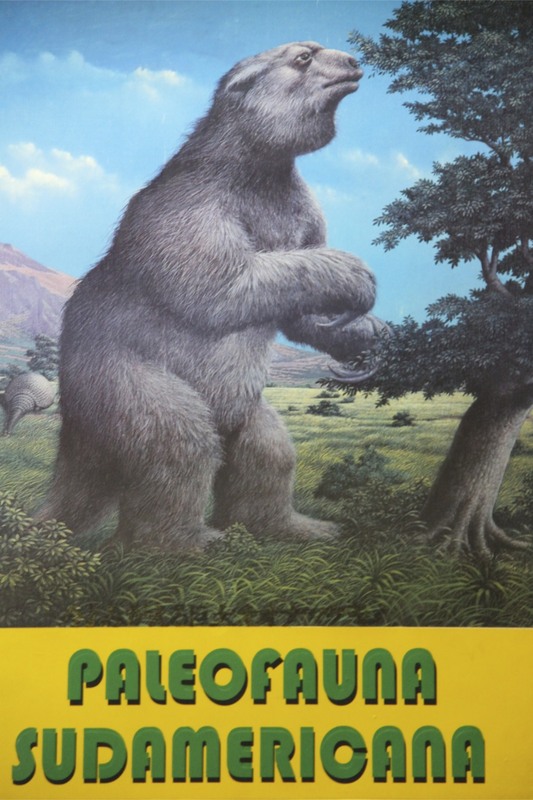 It feels like you’ve entered a forgotten world, something from a science fiction movie when intrepid adventurers stumble upon a hidden valley where dinosaurs still rule and humans are running around in animal furs shaking spears in mute fury. 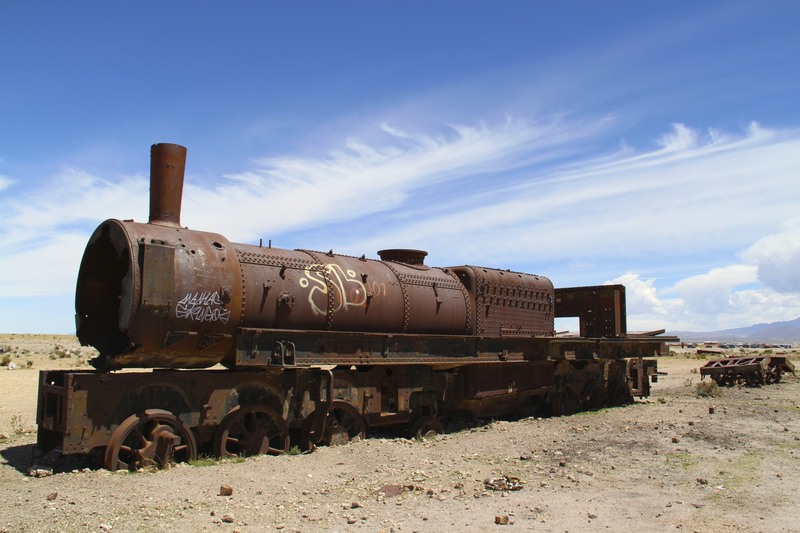 In truth it may not be this dramatic, but as you turn off the main Potosi – Oruro road you suddenly leave the earthy browns of this high altitude region behind and head into a lush agricultural valley stretching 25km eastwards. 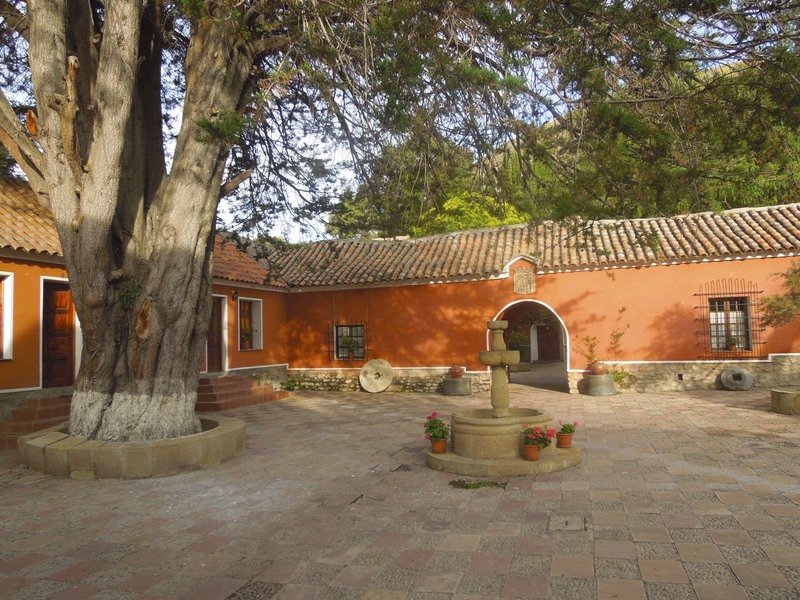 More of a surprise is what awaits at the end of the valley in the tiny village of Cayara: a beautiful hacienda sitting in the peaceful valley floor that has been continuously inhabited since 1557 and which has been lovingly restored and opened as a guest house. 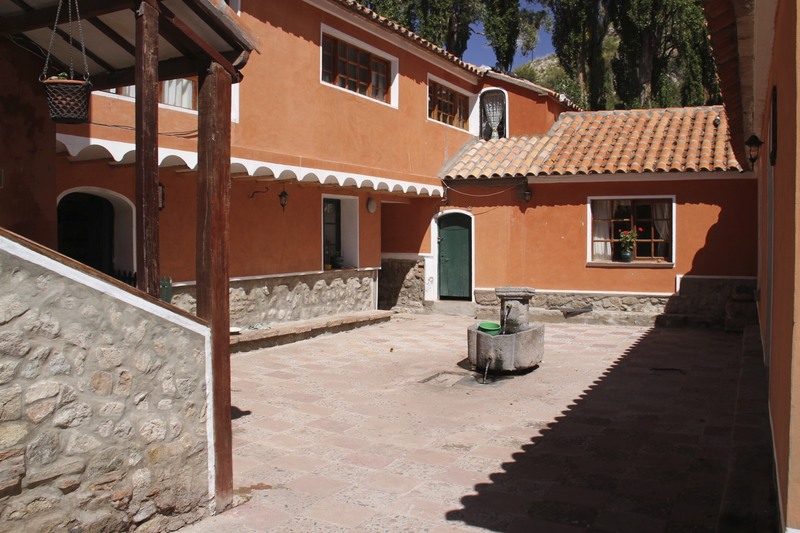 The Hacienda Cayara (www.hotelmuseocayara.com/english/museum.html) is one of the most beautiful and tranquil places I’ve ever been privileged to stay. 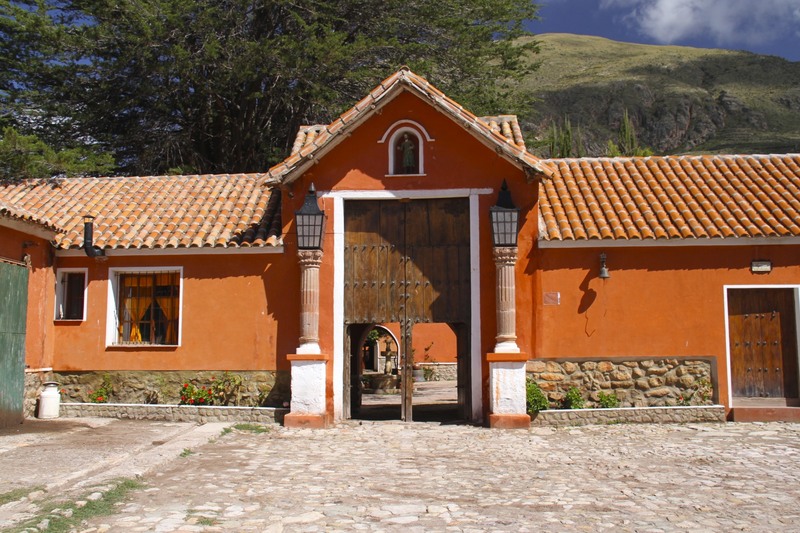 But it is much more than that, it literally drips with history – and the history of the hacienda is also the history of Bolivia from the Spanish conquest onwards. 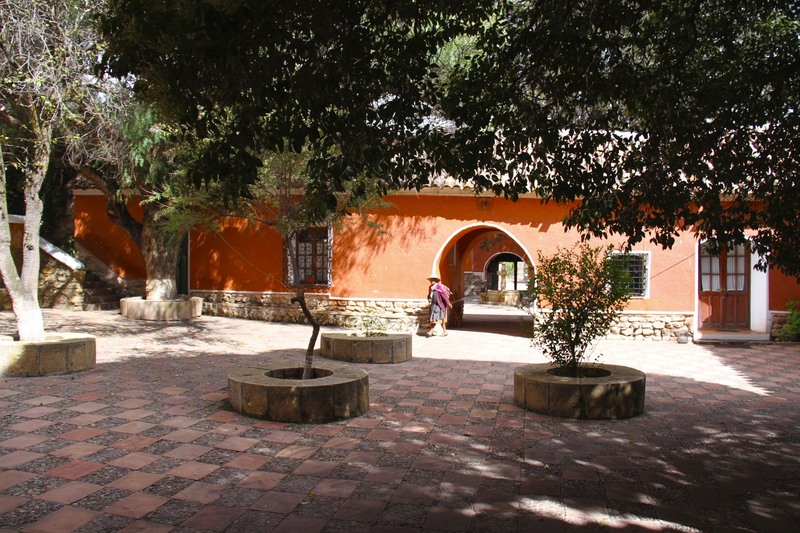 There are libraries containing original Sixteenth Century calf skin bound books; a natural spring that has been running into one of the courtyards for over 200 years and is so pure you can drink it without concern; a magnificent chapel that has been an integral part of the hacienda’s life for centuries; extensive grounds full of crops and flowers; and an inspirational museum that boasts the original armour of one of the first Conquistadors to arrive in Bolivia. 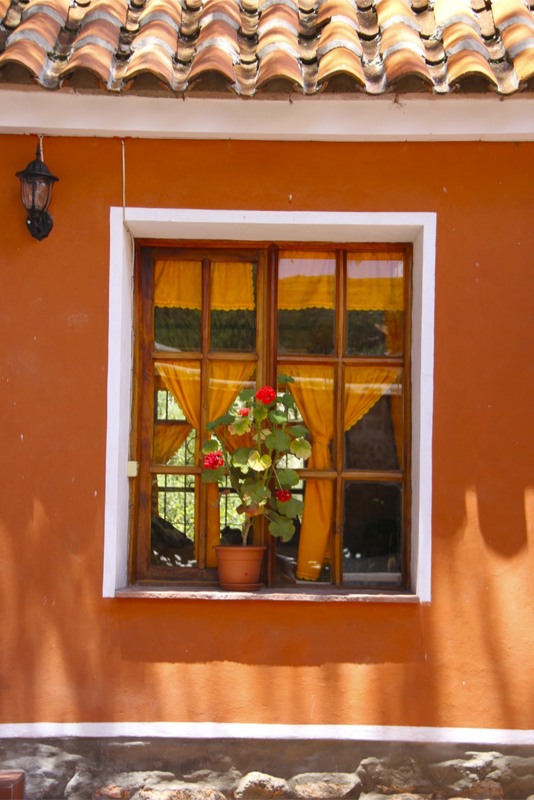 The hacienda is owned by the most charming and helpful man imaginable. How many hotels come with an enthusiastic and illuminating guided tour by the owner? If that wasn’t enough it produces its own milk, cheese, ice cream and fruit and vegetables – all of which you’ll get to sample over dinner and breakfast. The ice cream is absolutely delicious. 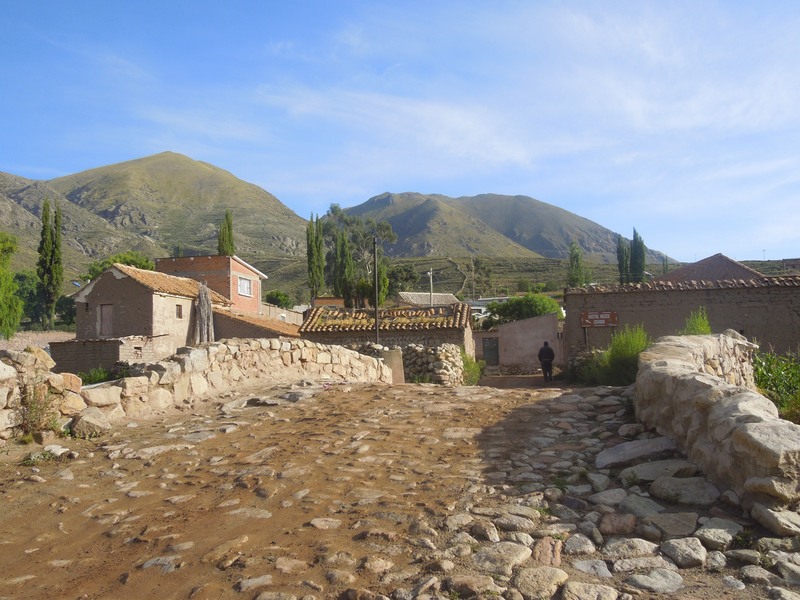 The surrounding village and valley are beautiful places to stroll in the early morning, soaking up the atmosphere as the village springs back to life and people start their day. A short walk from the village is a lovely waterfall, en route you can see dozens of birds of many different species, as well as people working the fields. 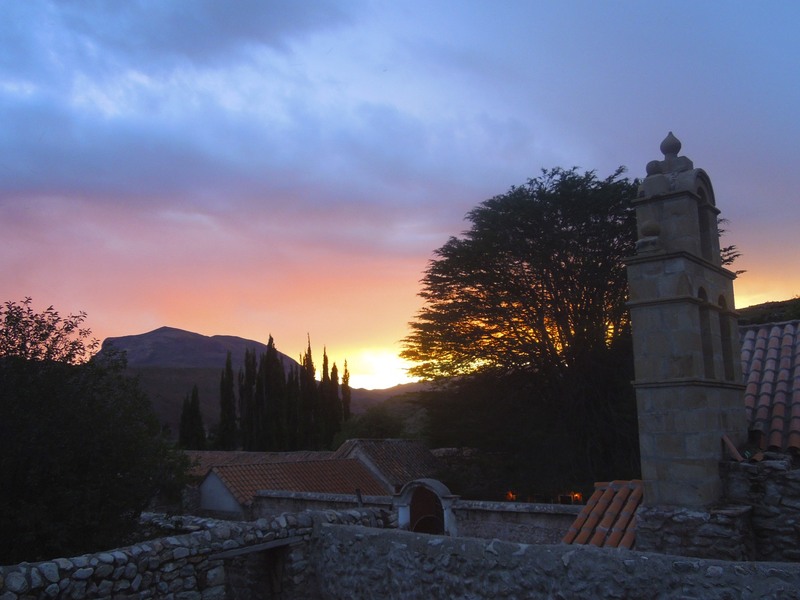 As night fell over the valley we were treated to a dramatic and beautiful sunset that set the sky and surrounding hills on fire, and with darkness the hacienda was illuminated and looked even more fabulous. 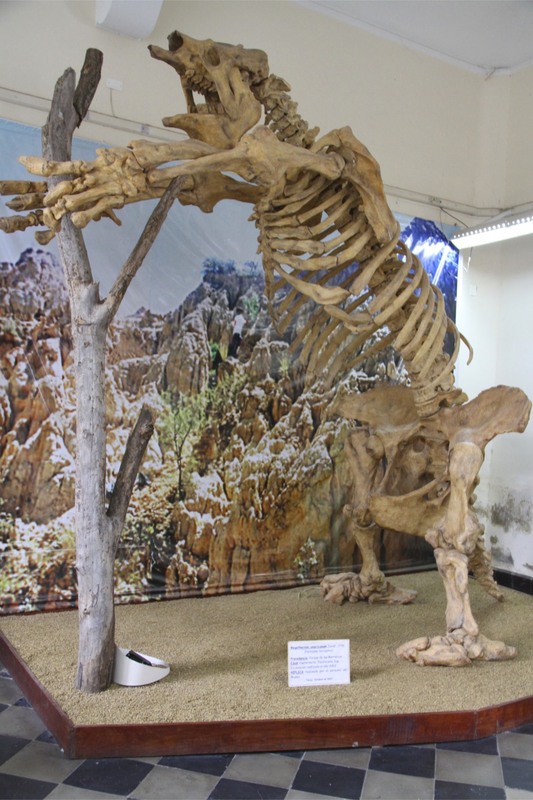 Even though I’m a fan of Potosi, my advice would be to skip spending the night in the city and make directly for Cayara, it’s only 30 minutes by car. I know we’ll be going back. 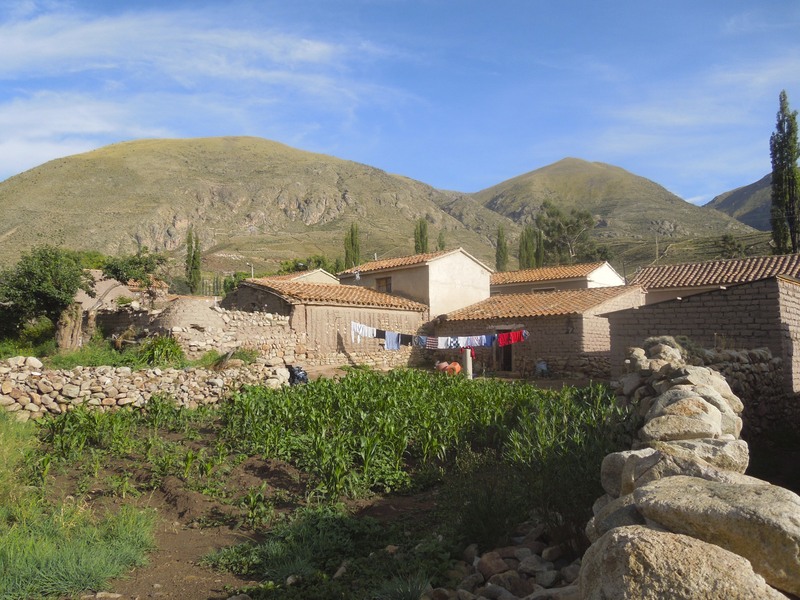 ‘Twas the Sunday before Xmas and there was only one place to go when in need of some last minute Xmas gifts or a fascinating insight into life in rural Bolivia: Tarabuco. 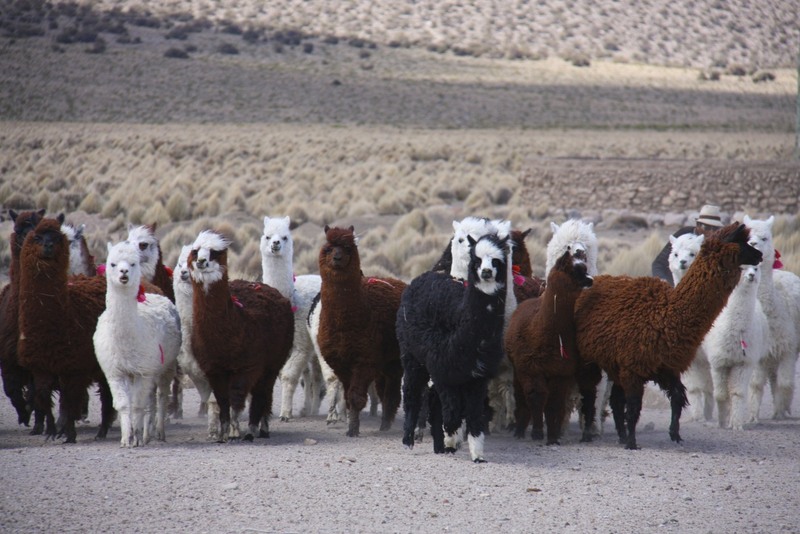 The market in Tarabuco is legendary in Bolivia for its superb weavings produced by the predominately Quechua speaking indigenous population. We have several beautiful Tarabuco weavings in the house, but it is possible to find many more wondrous items to fill those Xmas stockings. 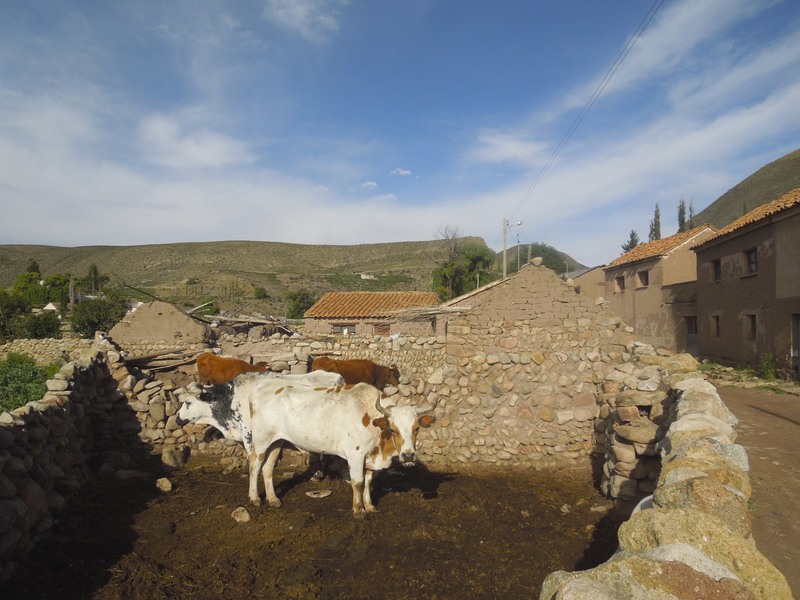 Tarabuco is a small village nestling amongst a beautiful mountainous landscape some 65km from Sucre. 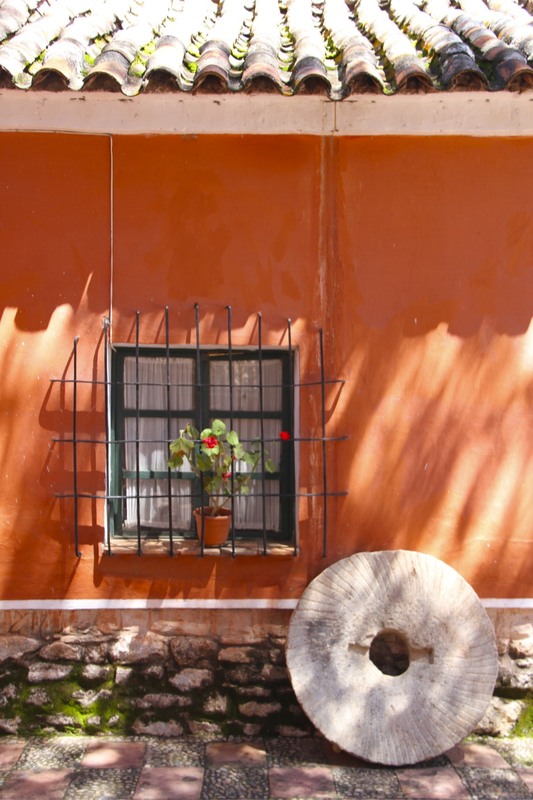 This alone would be reason to visit, but it is also the epicentre of the region’s famous weavings, all still done by hand on wooden looms with skills and unique designs passed down from generation-to-generation. 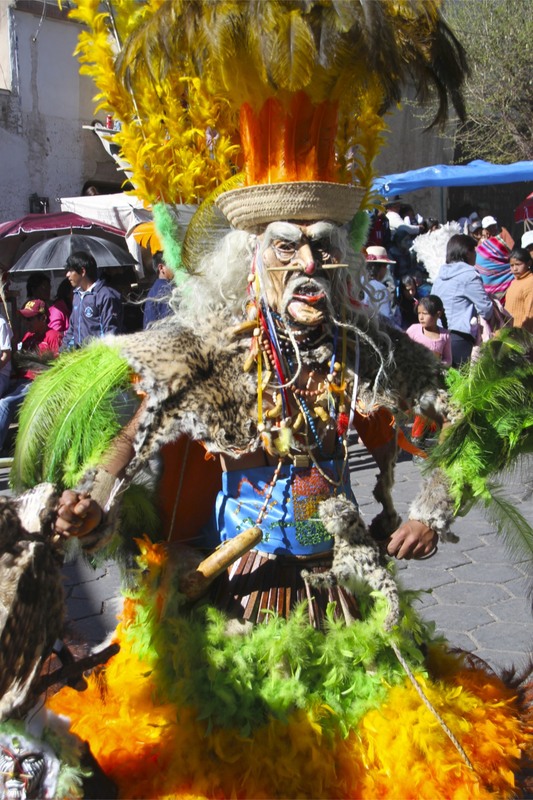 Tarabuco and the surrounding region is home to a unique Bolivian culture, and one that fought fiercely to retain its identity, first against the Inca empire and again against the colonising Spanish. 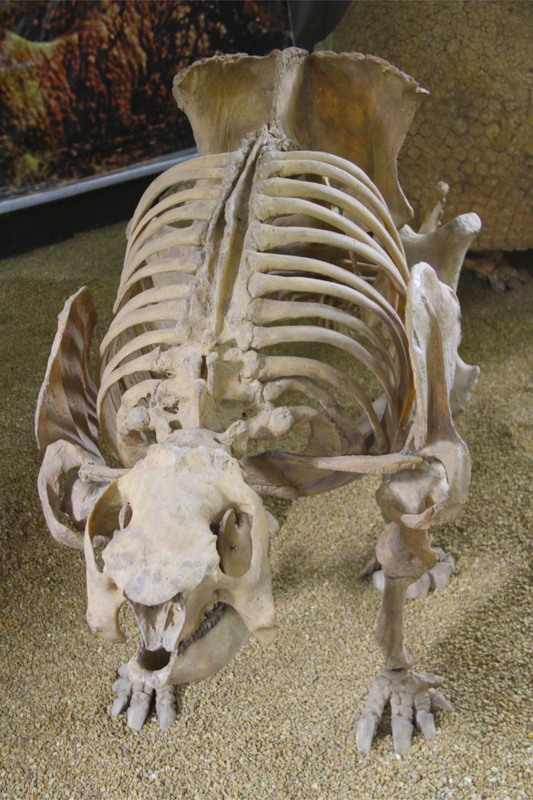 Both empires sought to subjugate the local Chiriguano tribes, and both struggled to quash the fierce resistance of the Chiriguano. The main plaza has a gruesome statue commemorating a famous victory (one of the few) over the Spanish – complete with a heart freshly ripped from the body of a Spanish soldier. Once you’ve recovered from the shock of that, it is time for some serious shopping…don’t forget to negotiate. 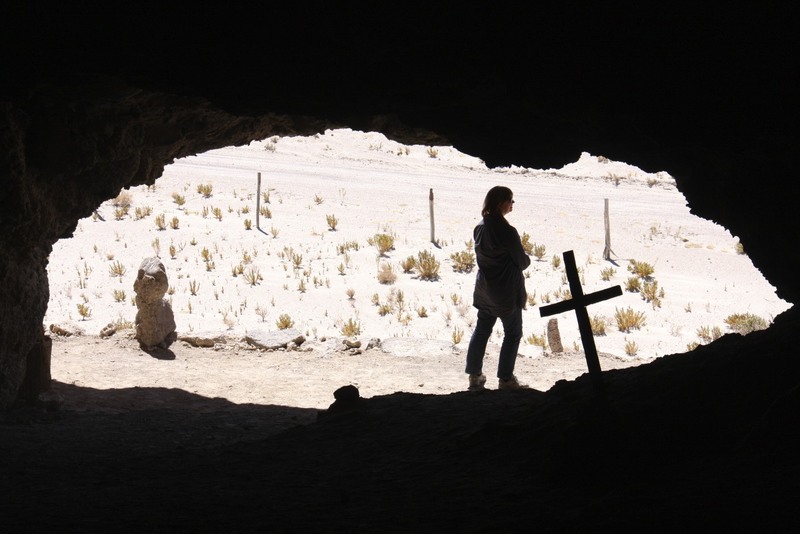 On the south side of the Salar de Uyuni is the infrequently visited site of Cueva del Diablo, a pre-Inca burial site situated in a cave part way up a cliff. 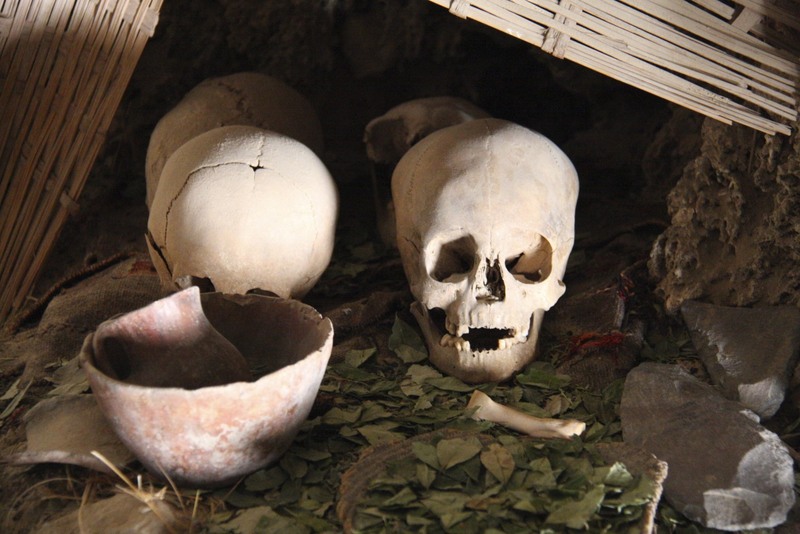 Inside the cave are a series burial sites that, when they were discovered, didn’t contain any of the remains or artefacts to give a clue to who was buried there or the culture they came from. 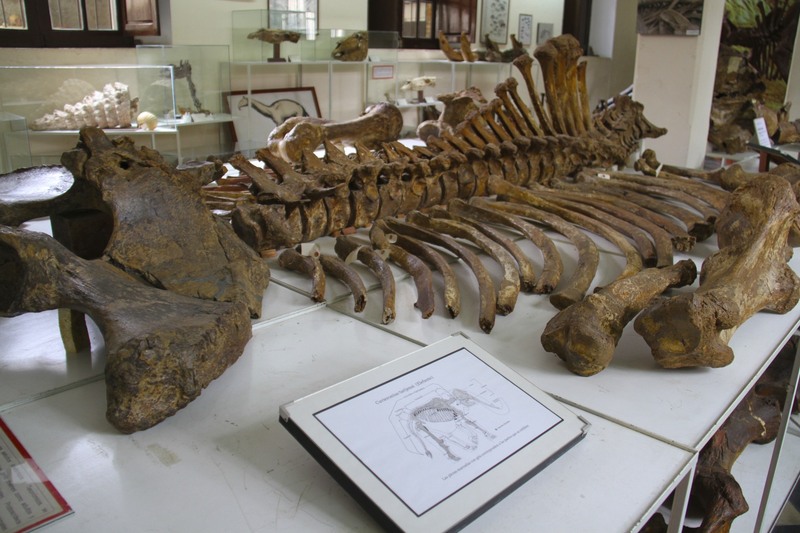 The site is covered in mystery as a consequence, although one theory is that the mummified bodies and artefacts were removed as the Spanish conquered the region. 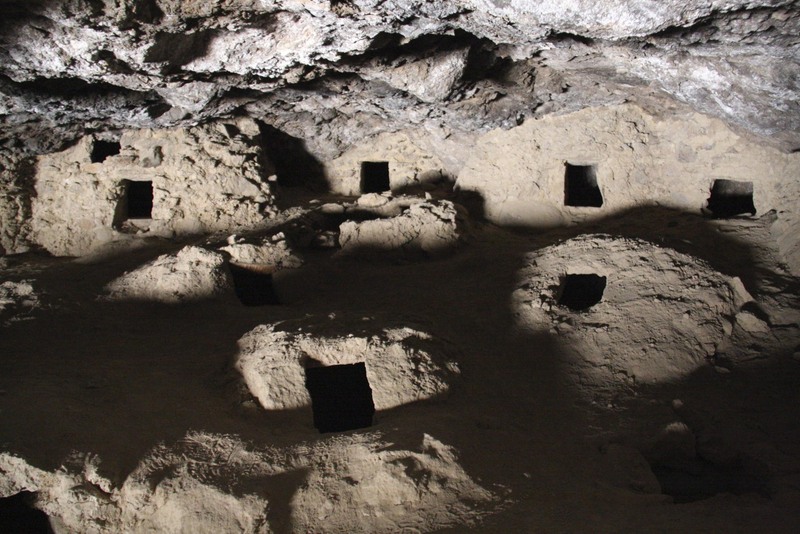 To add to the myth and mystique of the site it is also said that a young woman shepherdess was found dead in the cave in mysterious circumstances when taking shelter from a storm. 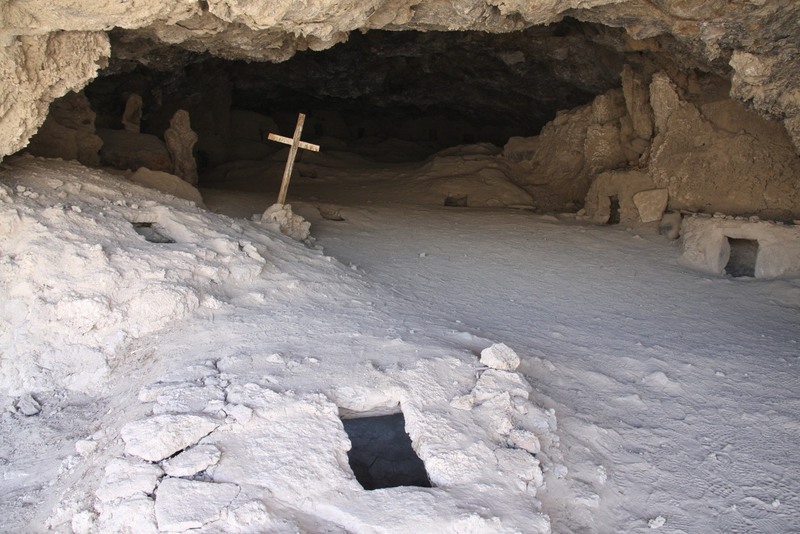 Inside the cave there are a couple of dozen graves, known as chullpas, a style of construction common to the altiplano region but normally seen out in the open as large square or rectangular structures painted in natural colours. 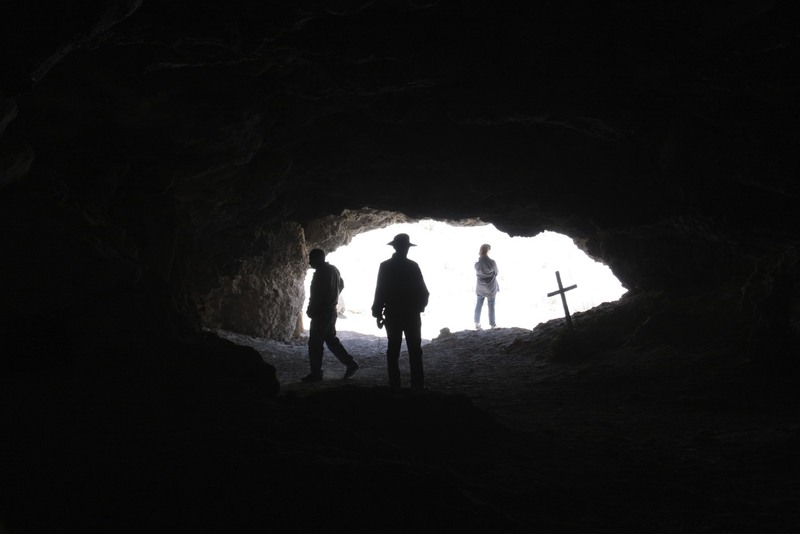 The view back to the cave entrance presented a good photo opportunity…all very Indiana Jones. 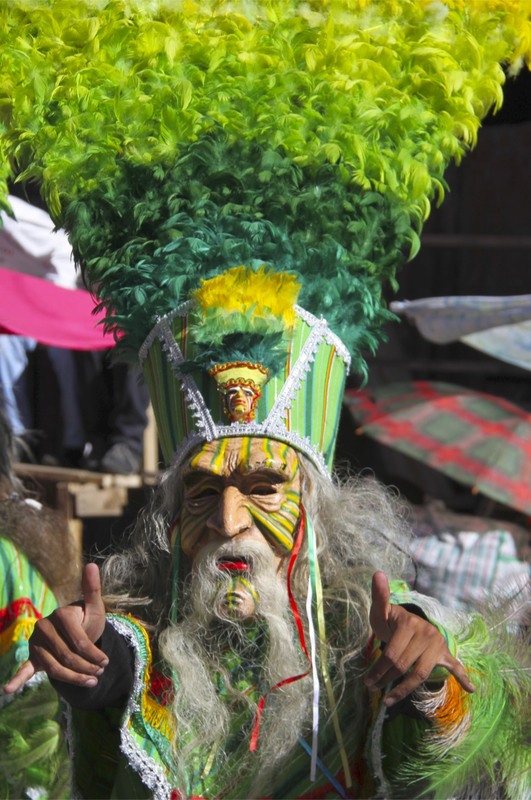 Bolivia is one of the most geographically diverse countries on earth, a land of contrasts and extremes. 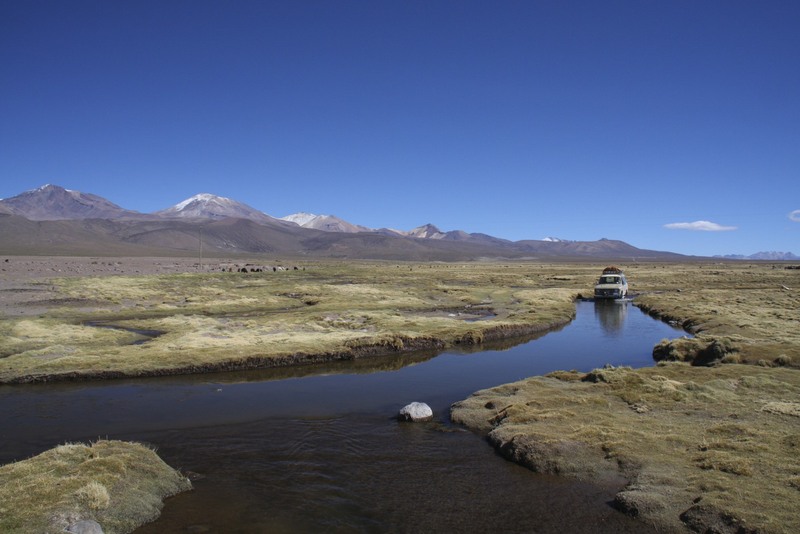 You can travel by boat deep into the Amazon basin (see previous posts) or you can climb high into the Andes north of La Paz in the Cordillera Real (see more previous posts). 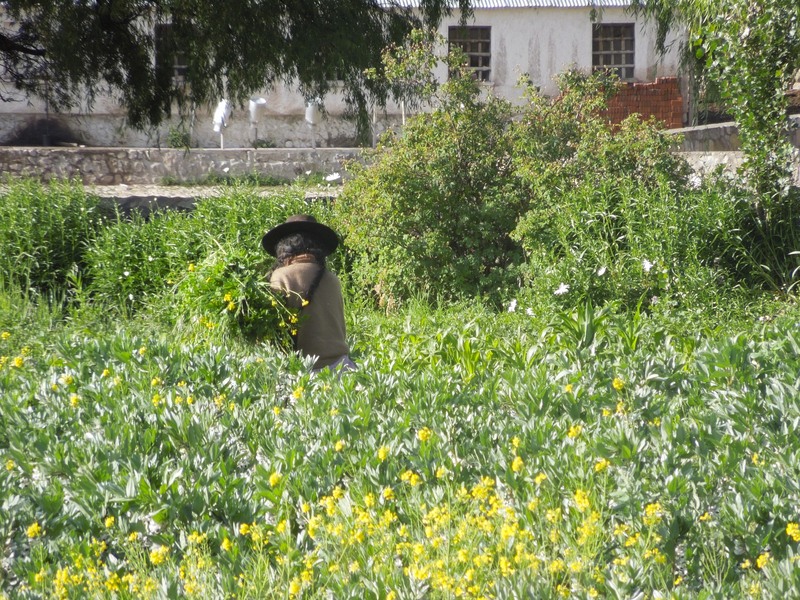 In between these two extremes lie dozens of different eco-zones as well as indigenous peoples and cultures. 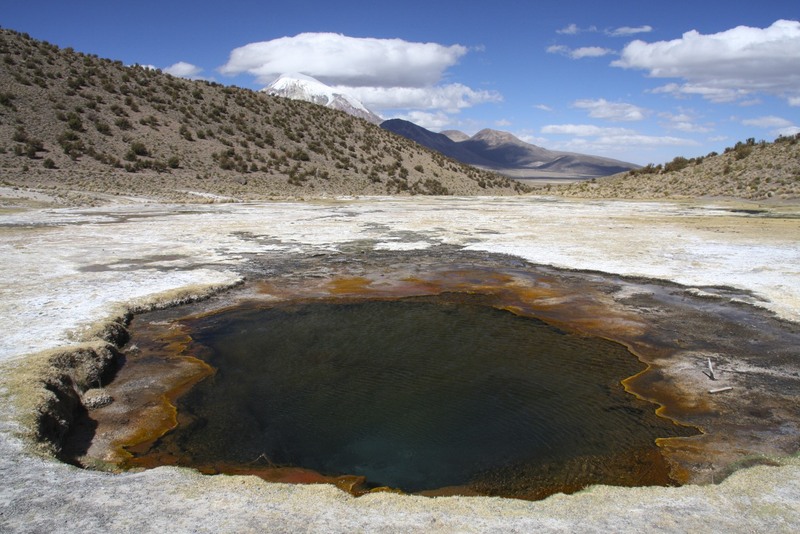 If there is one landscape above all others that Bolivia is famous for, it is the Altiplano. 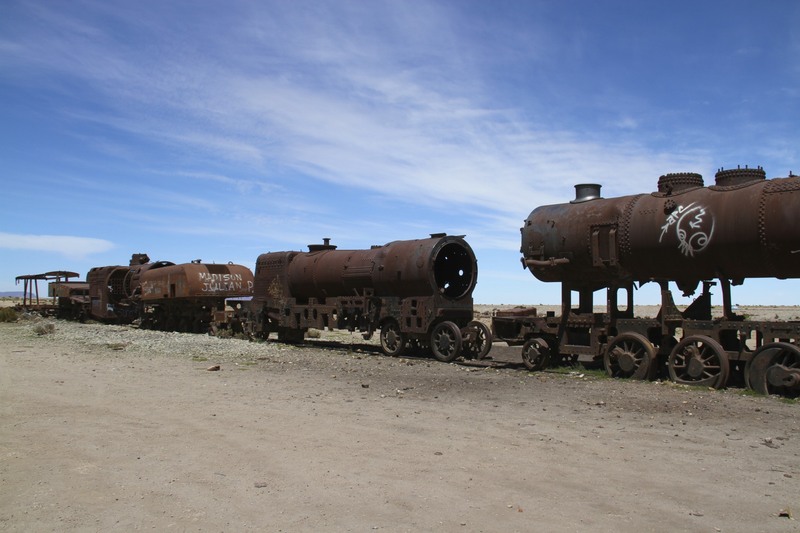 A vast swath of breathtaking high plateau (up to 4500m in altitude) that extends from northern Argentina and Chile across the whole of Bolivia and into southern Peru, the Altiplano defines people’s perceptions of Bolivia. 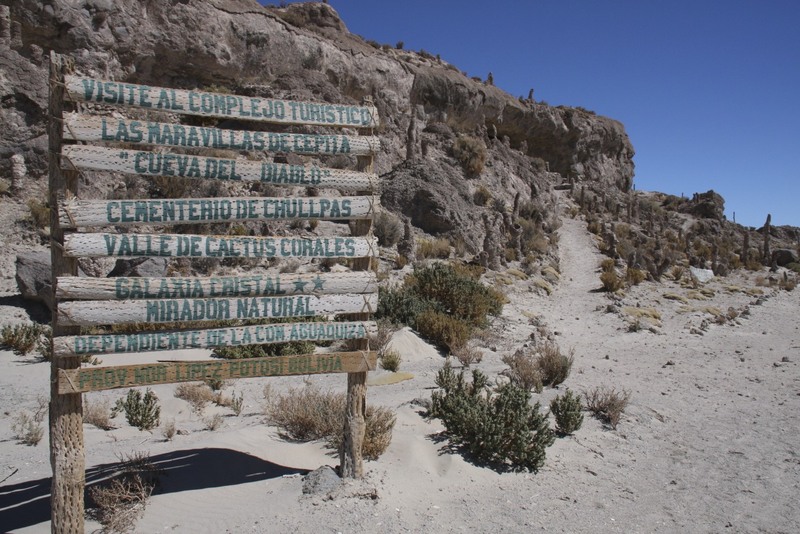 It is a seemingly barren and inhospitable place, but on closer inspection it is home to many animal and plant species and some of the most beautiful landscapes imaginable. 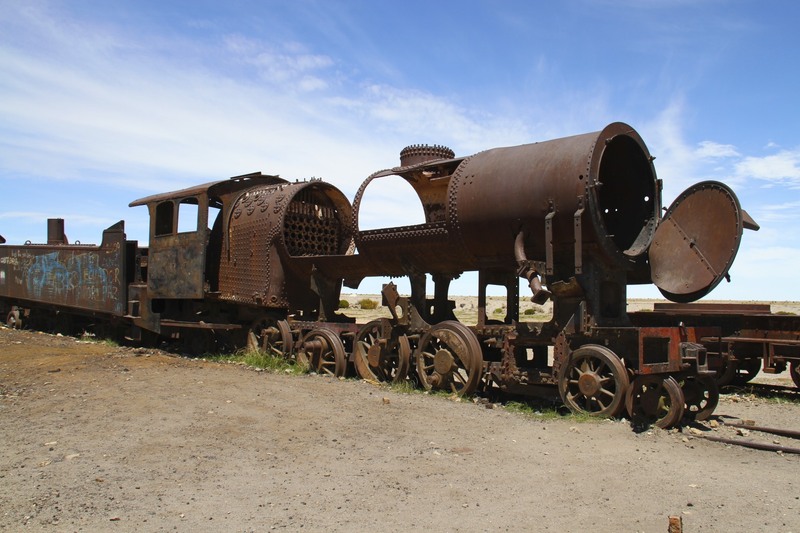 Travelling south from Sajama National Park close to the border with northern Chile, it is possible to drive on dirt tracks that run parallel to the border, and which follow a beautiful chain of volcanos (some still active) that stretch 4000km south to Tierra del Fuego. 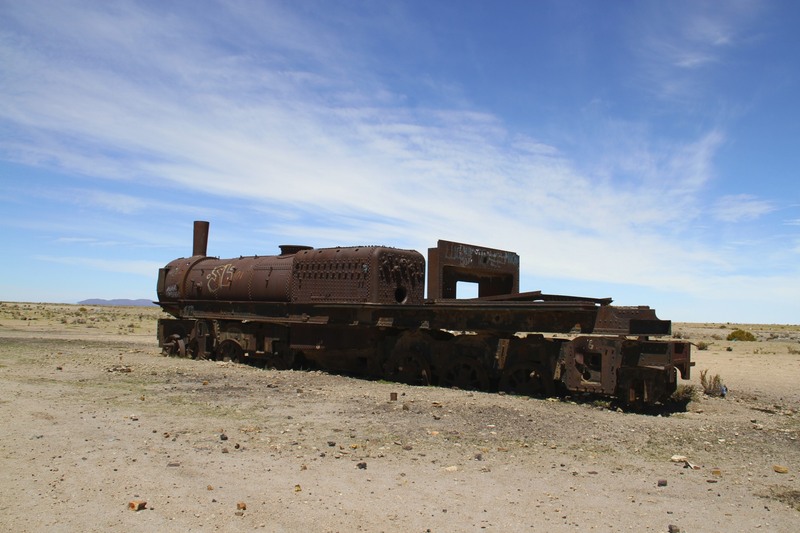 Eventually you’ll reach the south-western tip of Bolivia where it borders Chile and Argentina, from where you can head into either of those two countries at remote boarder posts. 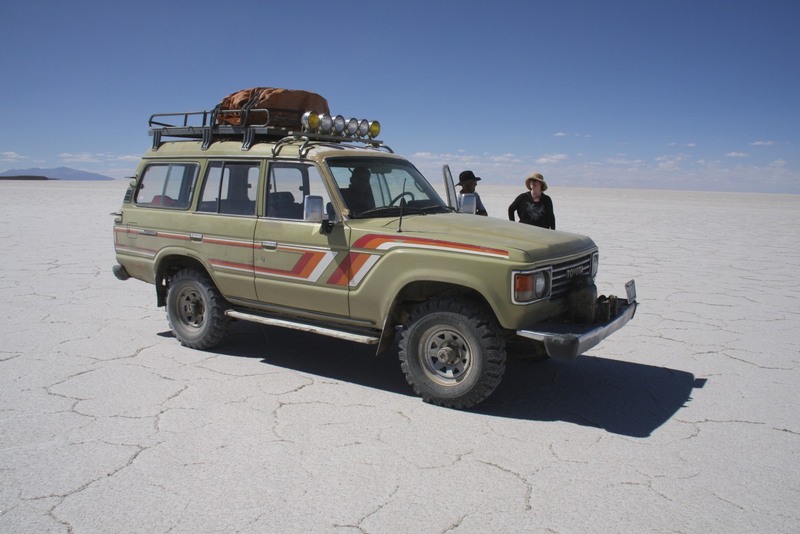 It is an incredible journey into some of the wildest places in Bolivia, a journey that has few rivals in Latin America. 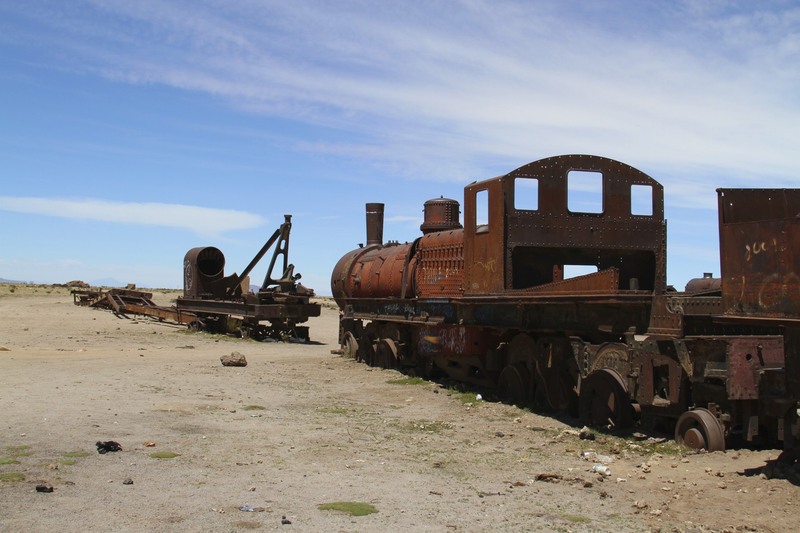 The route passes through remote communities of Aymara llama and alpaca herders; past abandoned villages and beautiful adobe churches; along the shores of brightly coloured lakes that are home to hundreds of flamingos; bubbling geysers and hot springs and the enormous salt flats of Coipasa and Uyuni (so huge they can be seen from space) also await exploration. 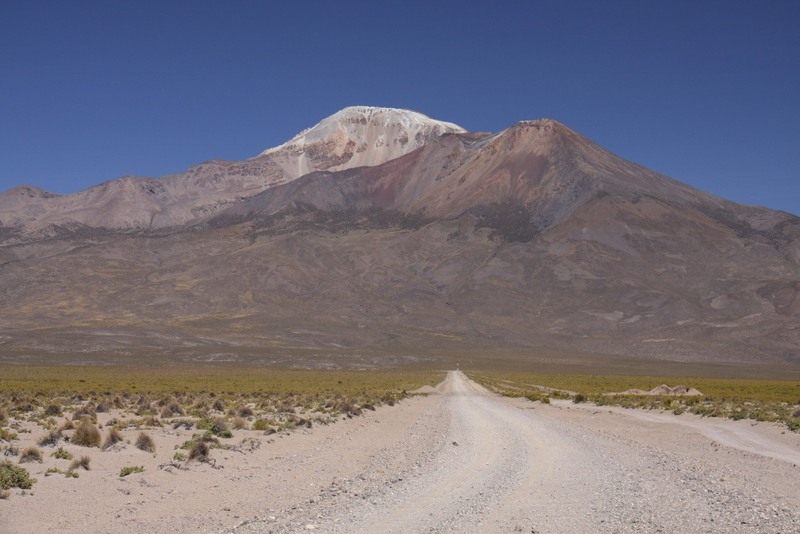 Starting the journey in Sajama National Park in the north west of Bolivia you drive through a vast landscape and under near-permanently cloudless skies. At times the sense of isolation is overwhelming. 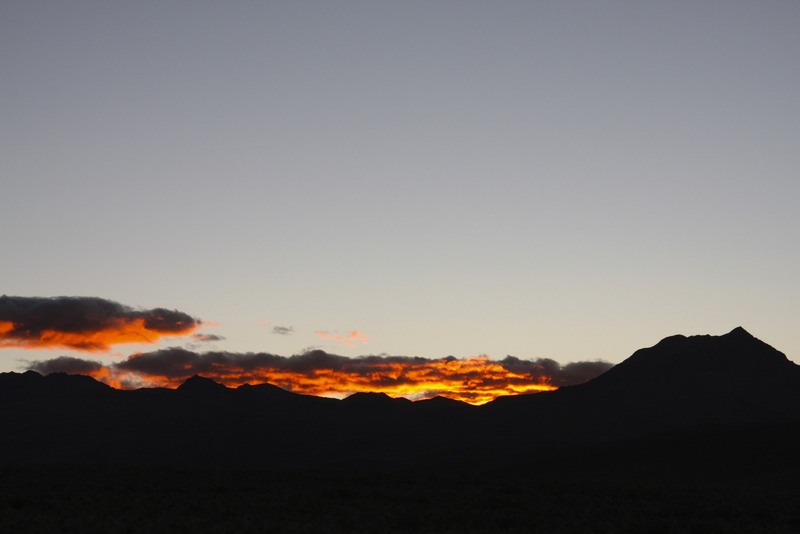 We spent a night at the lovely community run Albergue Ecoturistico Tomarapi in the small settlement of Tomarapi, about 10km from Sajama village, where we were lucky enough to witness a sunset that seemed to set the sky on fire. 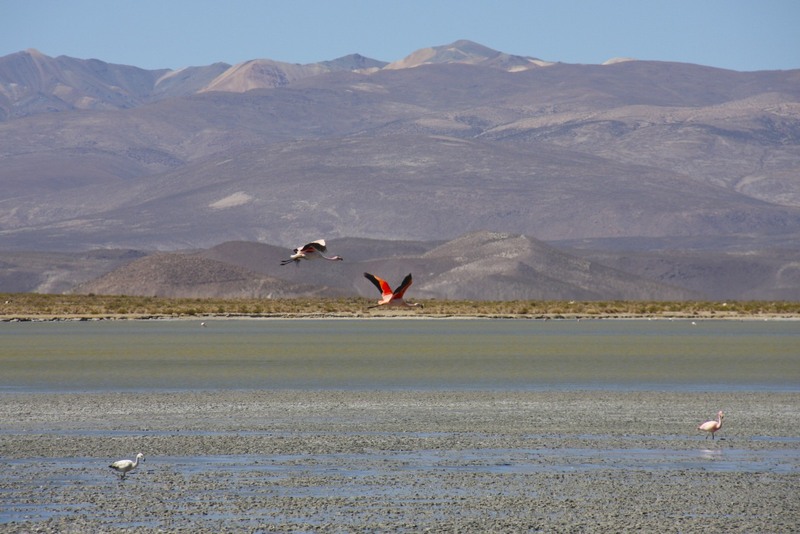 The following day we headed south on bumpy dirt roads, past several high altitude lakes with flamingos and a number of small villages en route to the Salar de Coipasa. 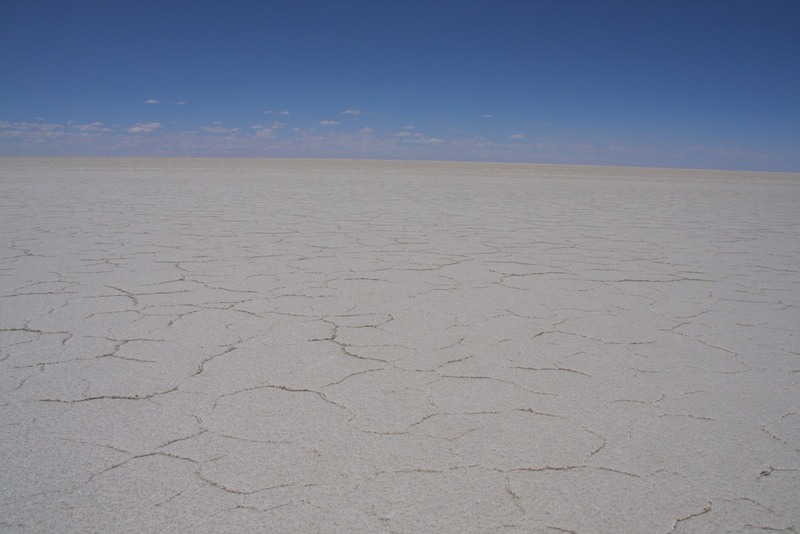 Emerging out of this arid landscape the sheer brilliance of the Salar de Coipasa is a shock to the system – dazzlingly white under the intense altiplano sun. 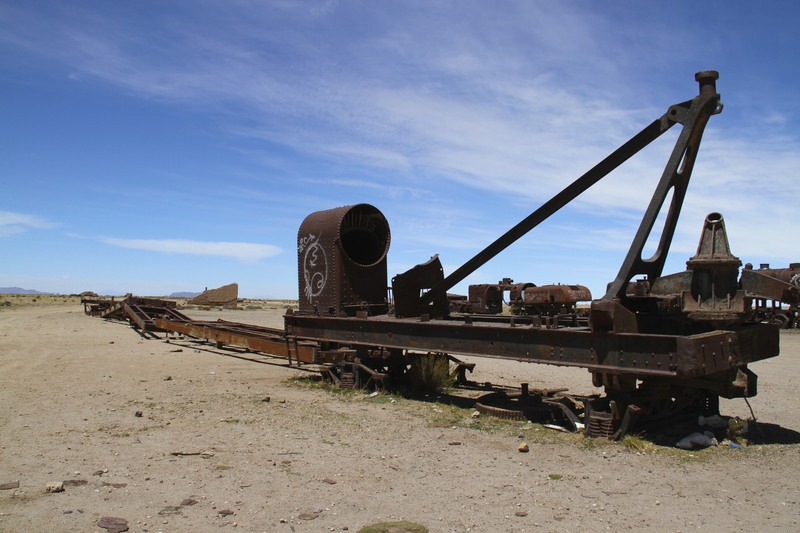 Once a large lake that fed Lake Titicaca, the Salar de Coipasa is now a huge salt flat covered in a salt crust made up of hexagonal shapes that seems to stretch to the horizon. 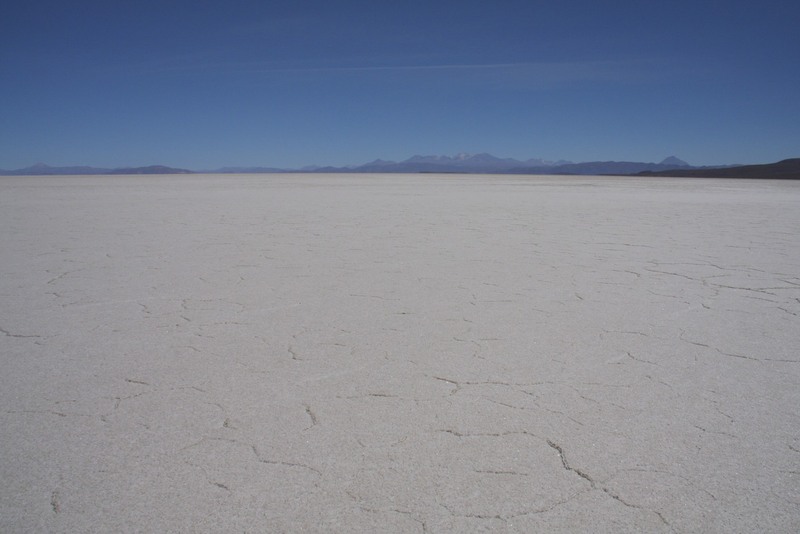 Smaller, less well known and with only a fraction of the tourists who visit the nearby Salar de Uyuni, Coipasa is none-the-less an amazing place where you can stand in absolute silence and not see another soul. Heading south again we made for the small village of Tahua, which nestles under Volcano Thunupa, where the lovely Tayka Hotel de Sal (www.taykahoteles.com) awaited our arrival. 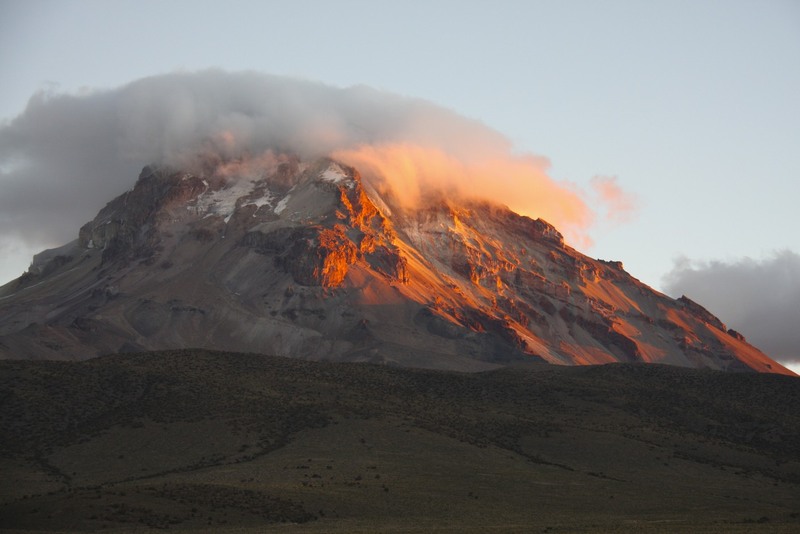 The Tayka chain of hotels are run on sustainable principles and are located in some of the most dramatic places you’re likely to ever find a hotel. 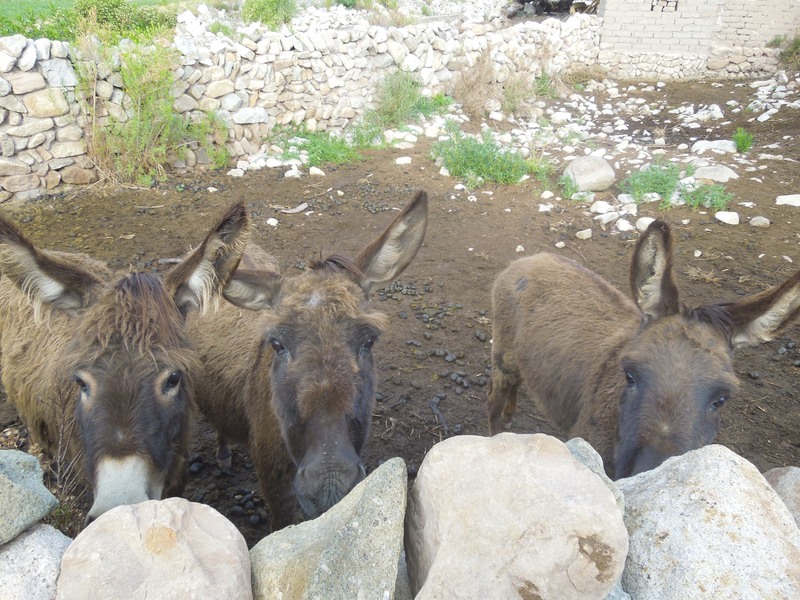 They are probably the most luxurious accommodations in the region, which comes at a price but one worth paying. 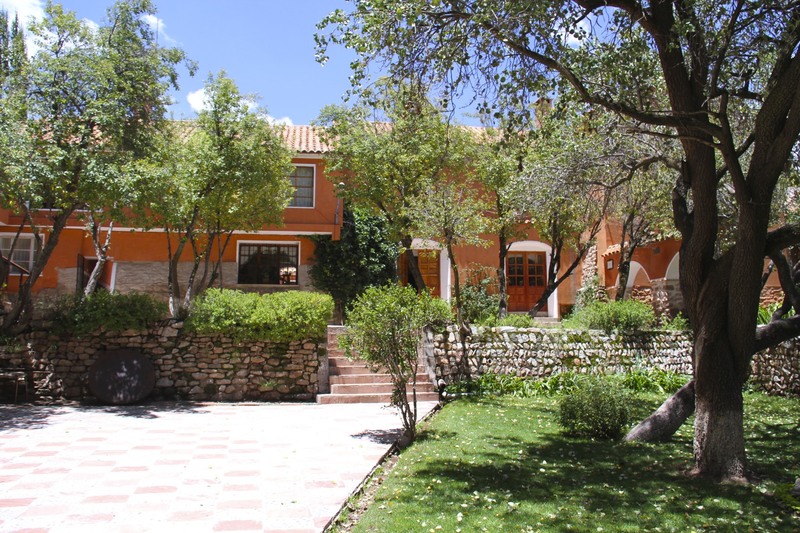 The Hotel de Sal is located just on the edge of the Salar de Uyuni and we arrived just in time to watch the sun set with a cold beer in hand…of which more later. 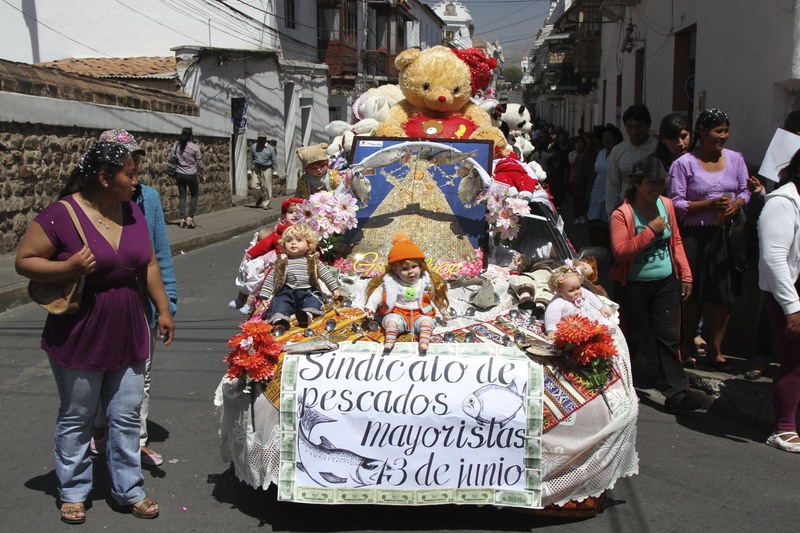 To be in Sucre during the build-up to its big festival, the Fiesta de la Virgen de Guadalupe, is to witness this normally tranquil and reserved city transform itself and embrace party fever. 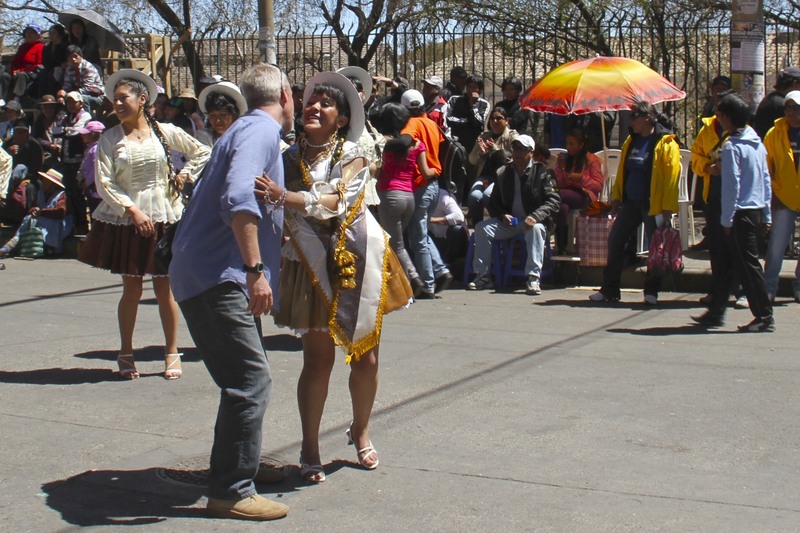 The fiesta is a huge event in Sucre and people come from across Bolivia to participate in the festivities. 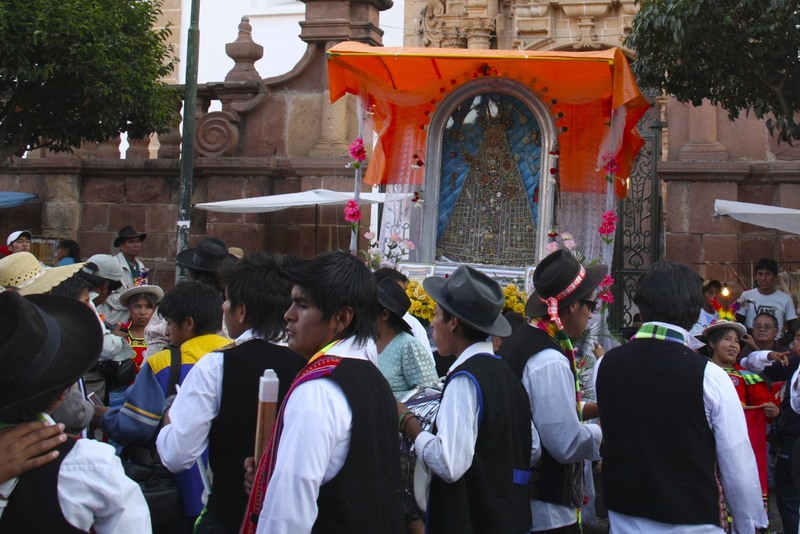 The festival celebrates the much venerated Virgen de Guadalupe, Sucre’s patron saint, whose flattened statue began life as a painting early in the seventeenth-century. Over time the painting was encrusted with all manner of precious and semi-precious gem stones until it needed to be reinforced with silver and gold plates. 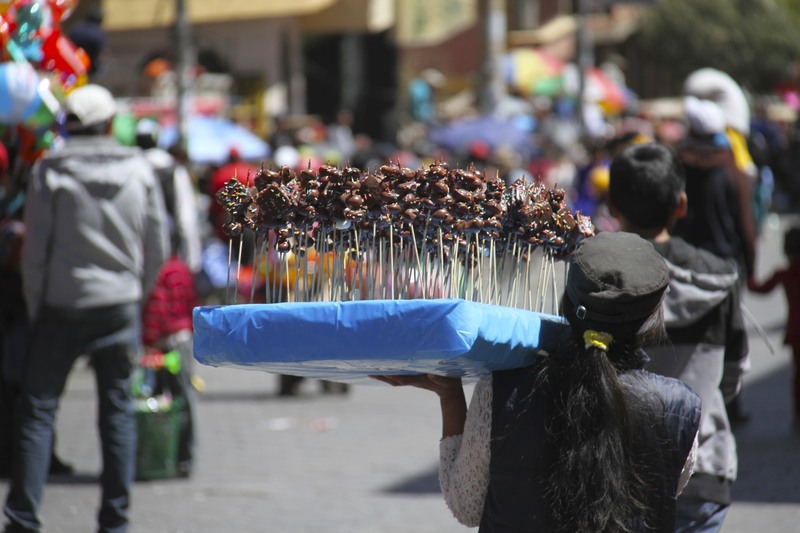 It could probably pay of a large chunk of Bolivia’s national debt. 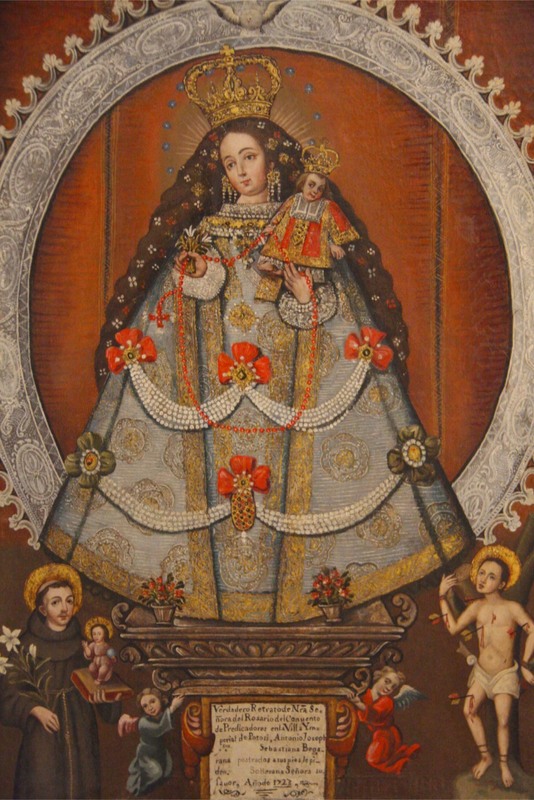 Our Lady of Guadalupe is also the patron of the whole of Latin America, and is typically portrayed as black or dark skinned. 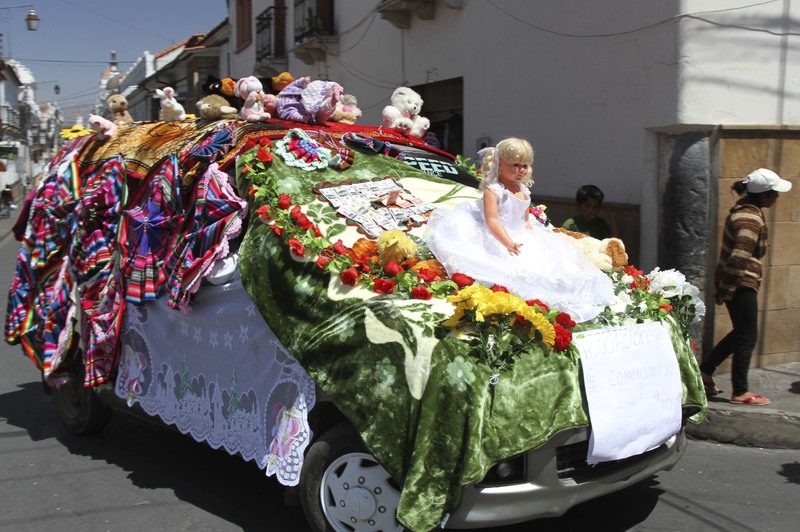 Guadalupe is an early example of recycling and actually originates in the remote Spanish region of Extremadura from where she was exported to Latin America by the Conquistadores, the most famous of whom such as Hernán Cortés, Francisco Pizarro and Vasco Nunez de Balboa also came from Extremadura. 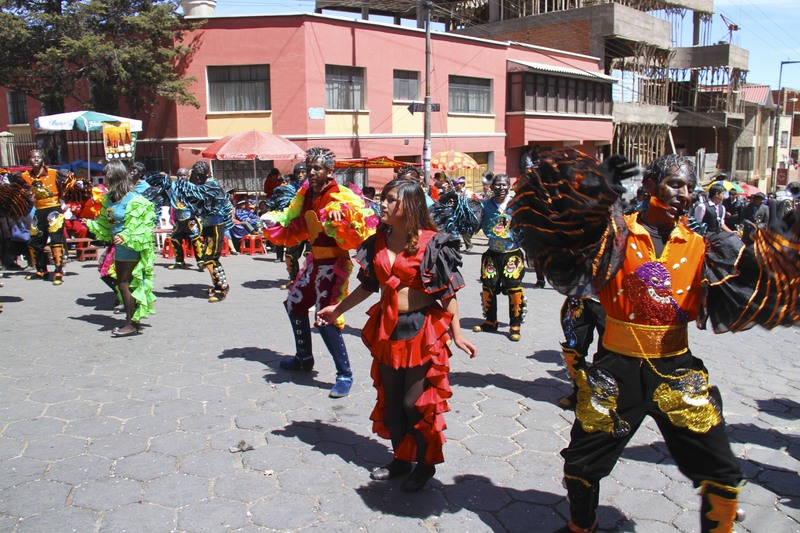 The last three weeks have seen a steady increase in activity towards the main festival on 14 and 15 September, groups have been rehearsing and it has been impossible to avoid bands who seem to practice day and night. 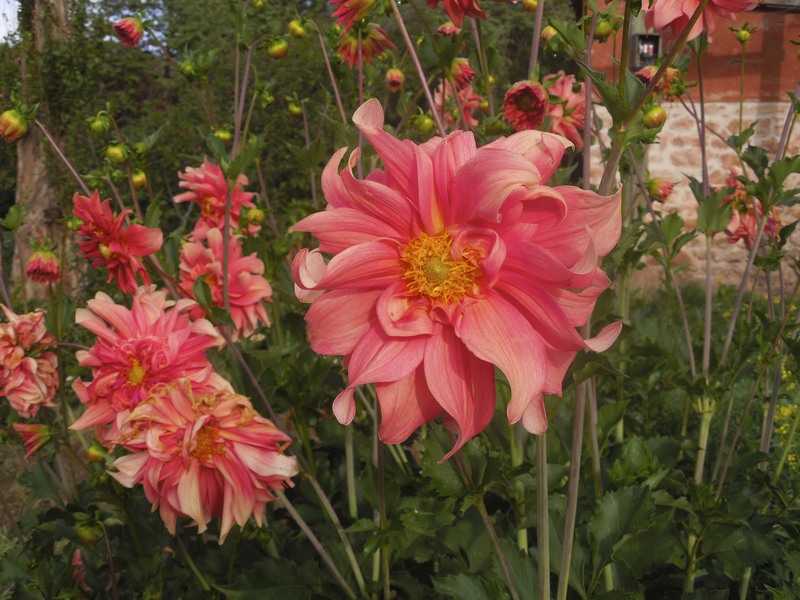 There’s also been a steady increase in the use of alarmingly loud fireworks, including a series of big fireworks last night which went on until 2am – it wouldn’t be fiesta without singularly dangerous pyrotechnics keeping everyone awake. 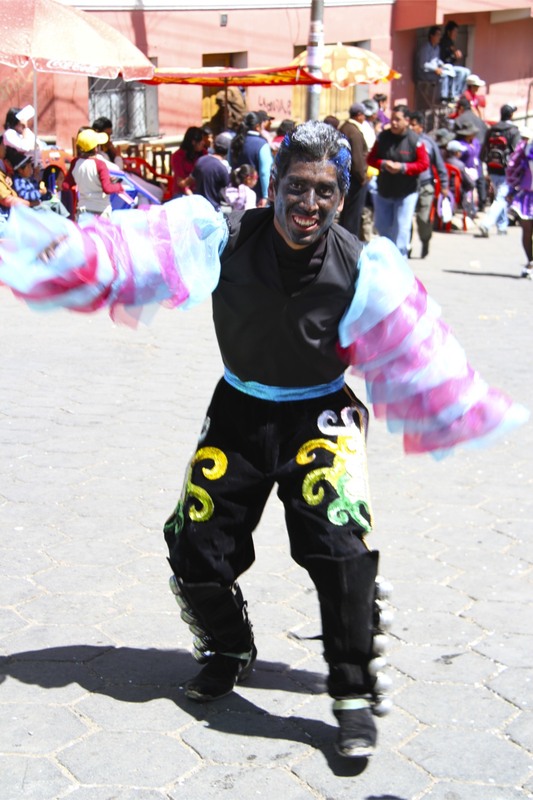 This weekend was set aside as a practice run for the main event, and all over Sucre you could spot groups of people putting themselves through their paces. 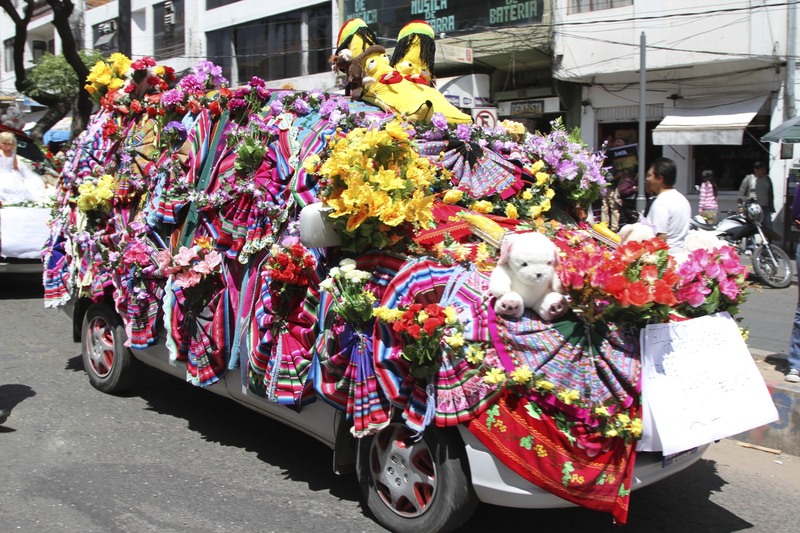 In a fun but unusual twist, there was a large parade of highly decorated cars snaking around the city and creating endless traffic jams in their wake. 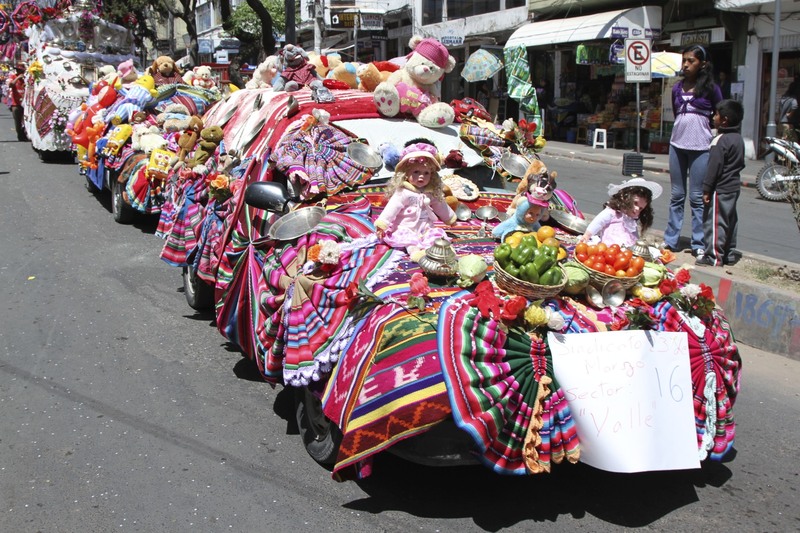 Most of the cars belong to cooperatives who work in Sucre’s Central Market, and the decorations of fruit, vegetables and meat reflect this. 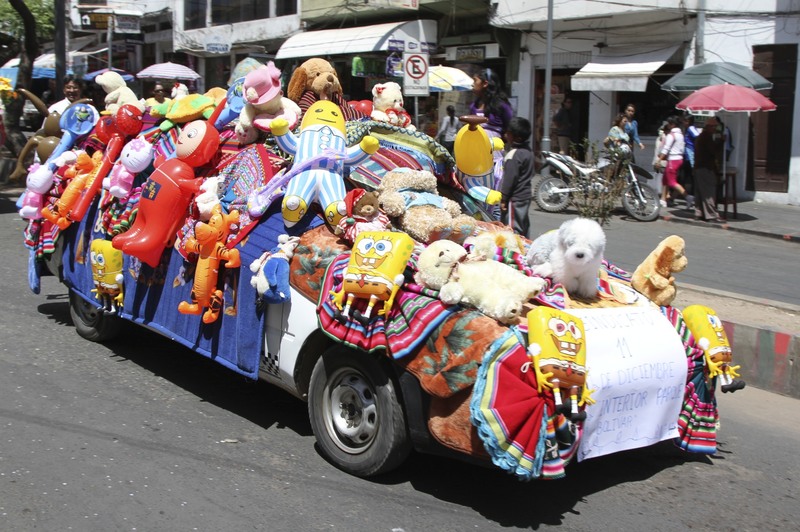 The cars are decked out in brightly coloured cloths, stuffed animals, inflatable toys, dolls, silver bowls, plates and cutlery. 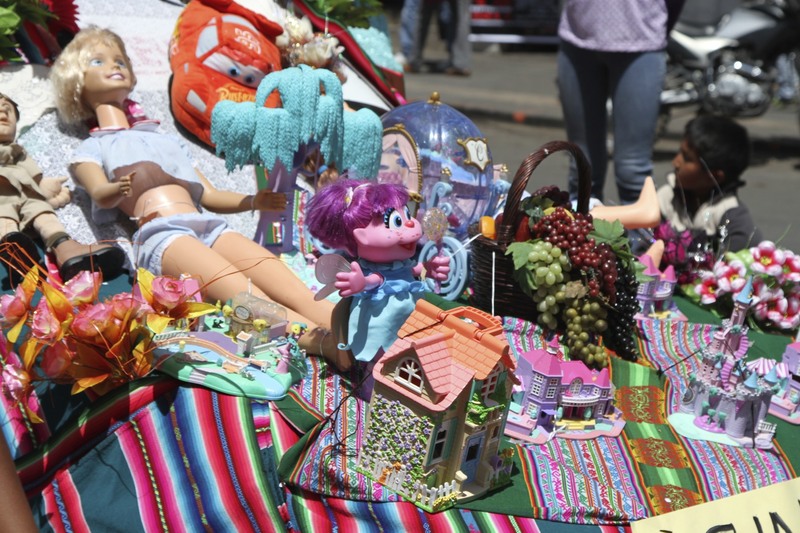 Many of them have fake money, houses and other desirable items attached, and prayers are offered to the Virgen de Guadalupe in the hope of receiving wealth and success in return. 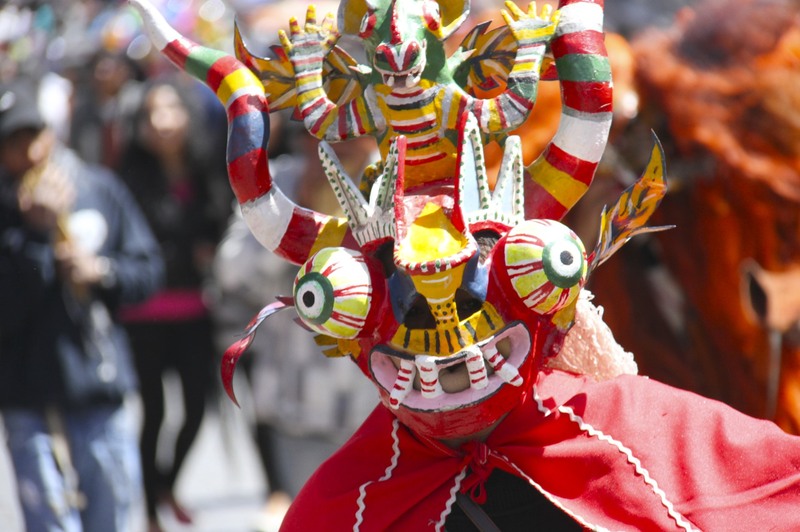 They create a bizarre spectacle as they make their way around the city before being welcomed back to the Central Market by a band and more fireworks. 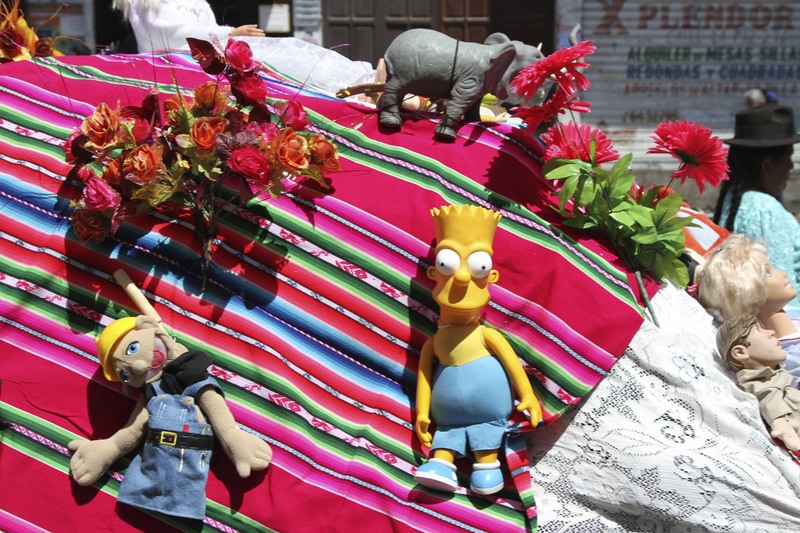 I’m not sure what role Bart plays in the Bolivian Church, or what dreams and desires he represents, but he made an appearance on one of the cars. 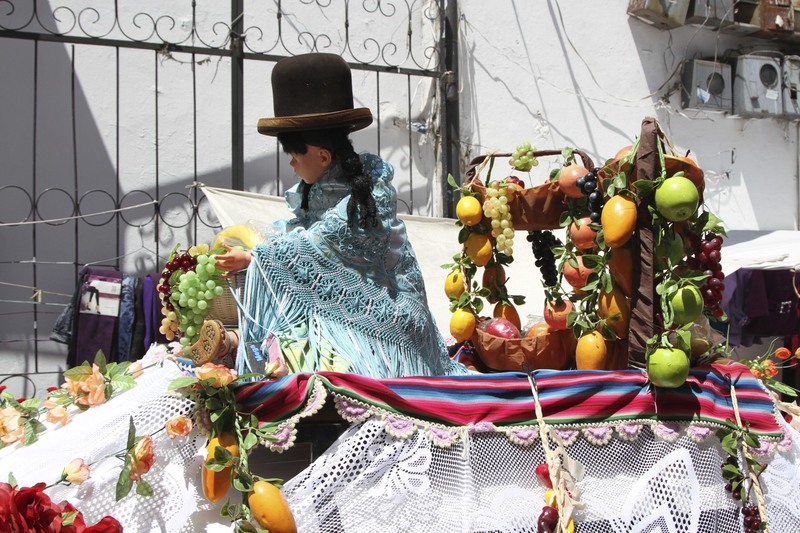 Saturday dawned bright and sunny, and the Ch’utillos Festival started early with a parade around Potosi at 9am with the statue of San Bartolomé accompanied by the town’s mayor and other dignitaries, cue lots of incense and confetti. 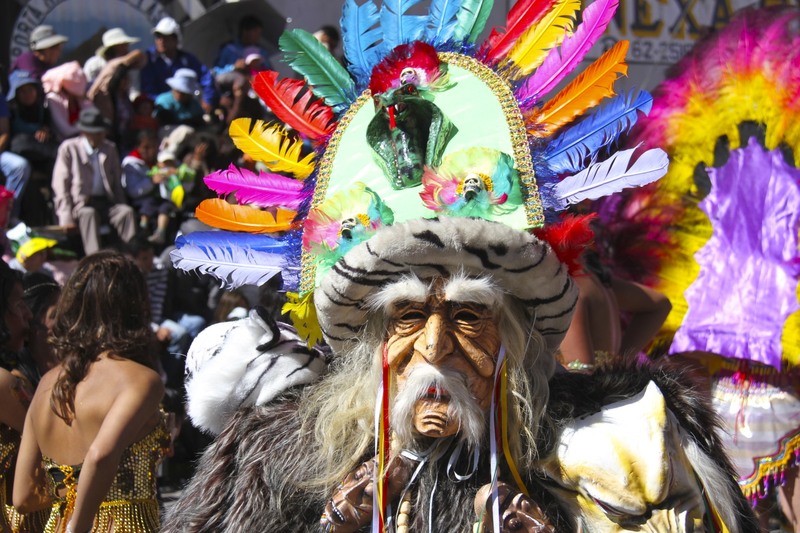 Afterwards, the festival really came to life with bands and big groups of dancers taking over the streets, many of them dressed to thrill in spectacular costumes and masks of historical figures or mystical creatures. 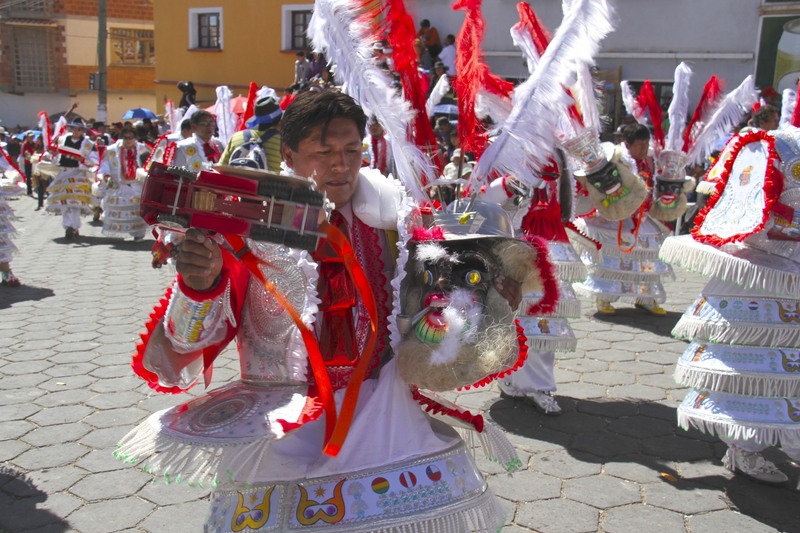 One of the groups at the start of the day depicted African slaves, who were brought to Potosi to work in the silver mines – literally millions of Africans died alongside indigenous Andean peoples in some of the most inhumane conditions imaginable. 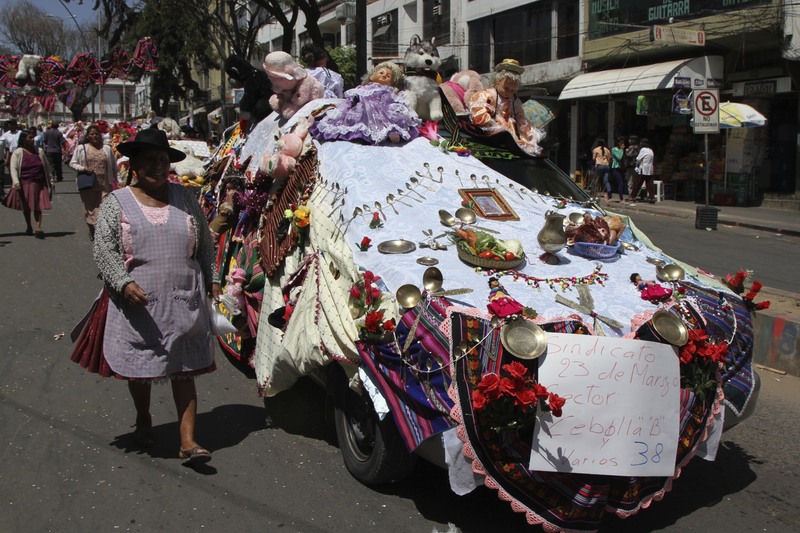 This is unique to the Ch’utillos Festival and highlights one of the less well-known aspects of Spanish colonialism in Latin America. 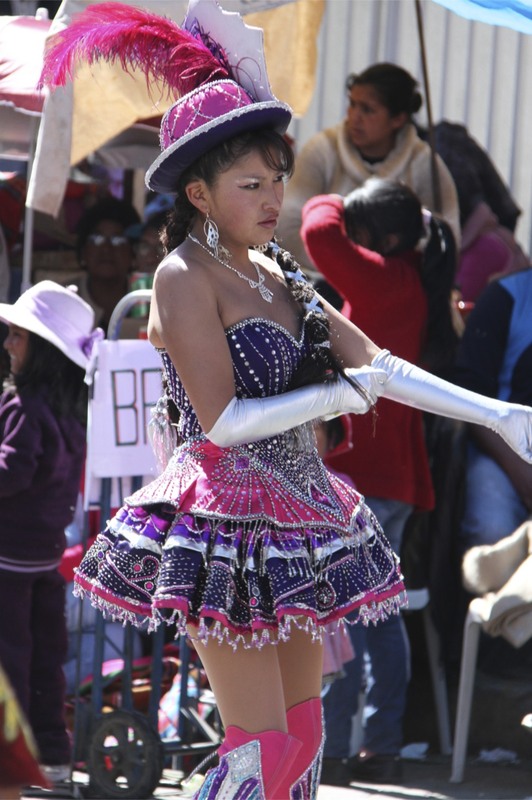 While the Trans-Atlantic slave trade is much better understood in North America and Brazil, the descendents of African slaves still live in Bolivia, mainly in the tropical lowlands. 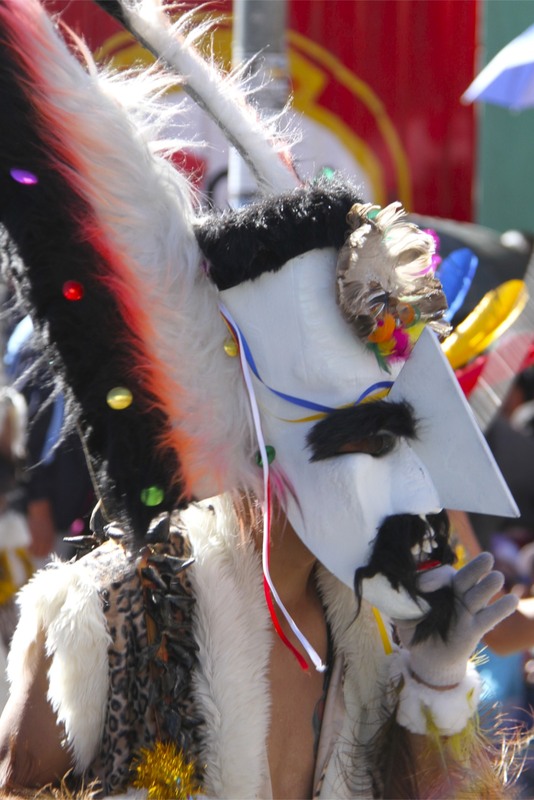 There didn’t appear to be any African descendents in the parade, so, local people ‘black up’ to portray Africans. 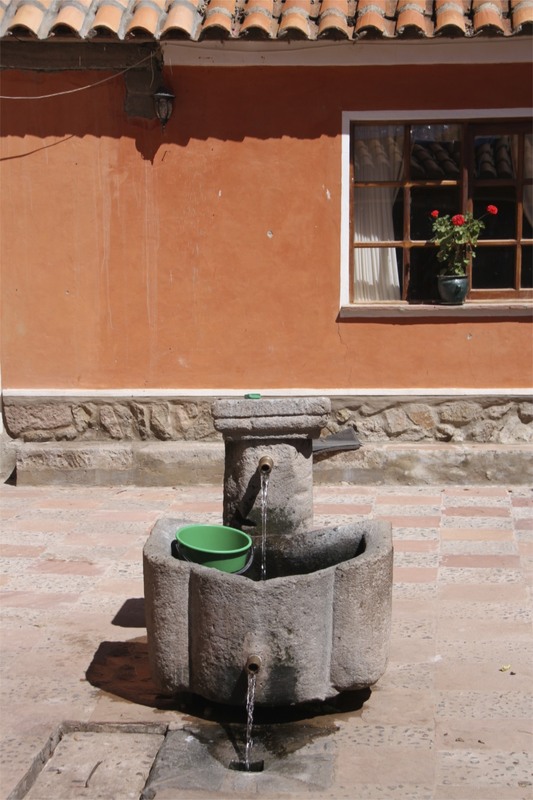 Seen from a contemporary European perspective, this could make for uncomfortable viewing, but it is good that this aspect of Potosi’s history isn’t forgotten. 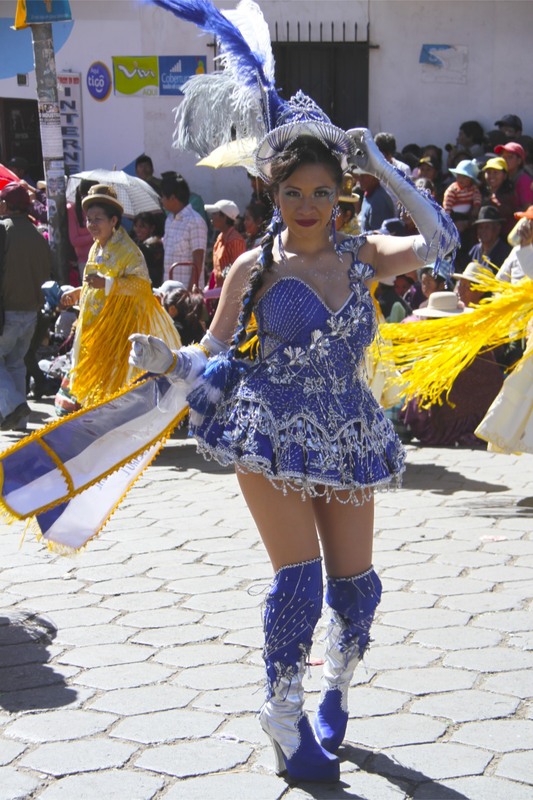 Several thousand people participate in the festival, and thousands more line the streets eating, drinking (lots of drinking) and cheering the performers on. Wave after wave of dancers and bands sweep up and down the streets, but the atmosphere is always fun, informal and relaxed. 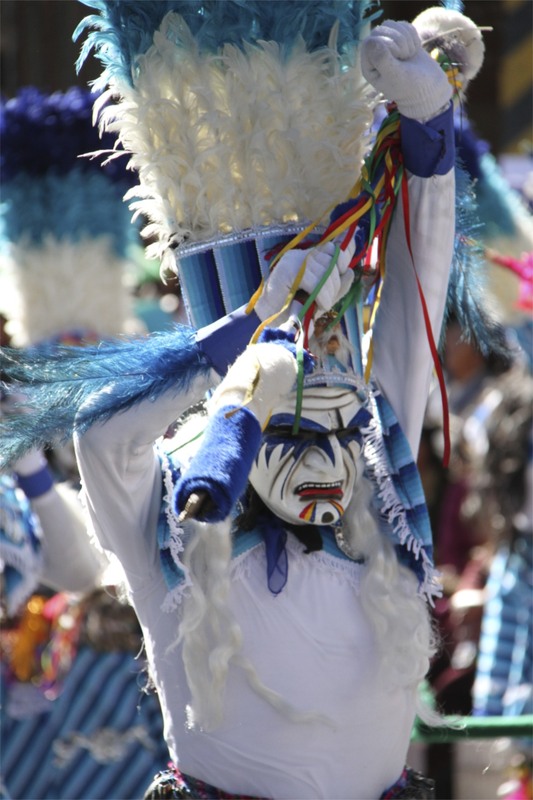 The performers take several hours to complete the full route, and it must be hard work performing under the harsh Potosi sun, dancing up and down hills at 4000 metres altitude – especially in some of the big, heavy and hot costumes people wear. A bit like marathon runners, performers need to take a lot fluids on board. Unlike a marathon, most of these fluids seem to be alcoholic – although there is that one marathon in France where you receive a glass of local wine and something delicious to nibble at each mile marker. This was a bit like that. 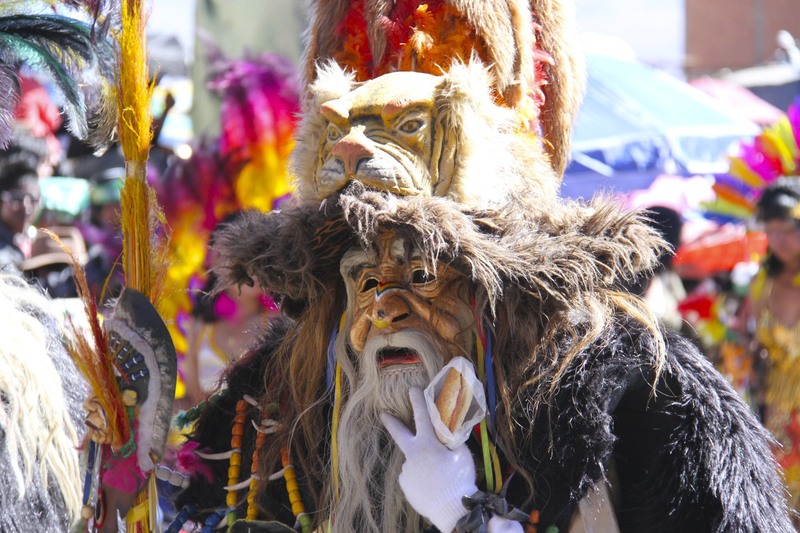 One of the most impressive aspects of Ch’utillos is the array of extraordinary masks warn by the performers, variously depicting historical figures or terrifying mythical creatures. 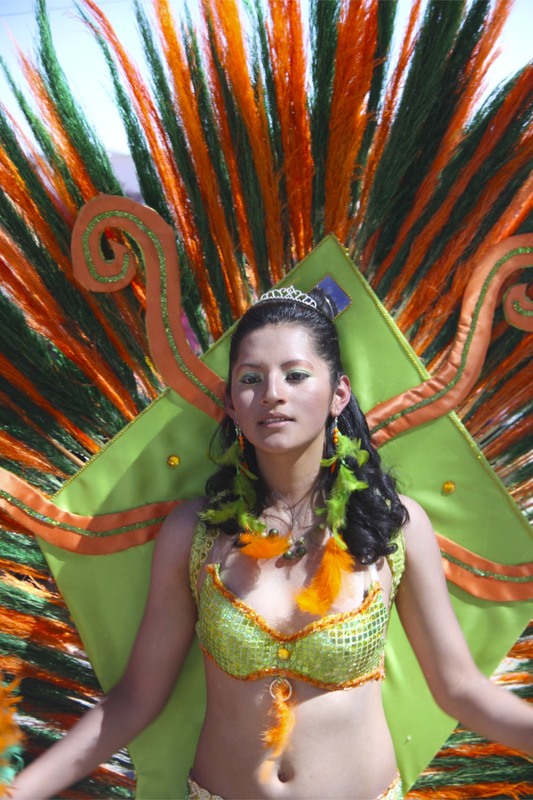 I’m not sure what the origins of some of the costumes are, but typically the costumes worn by women tend to be more revealing than those worn by men – no surprises there, I suppose – although no less dramatic. 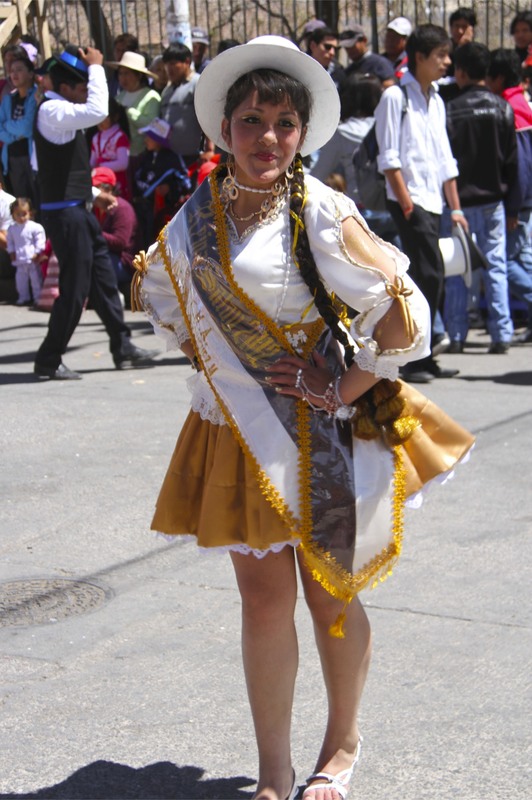 Although a typical sight in La Paz and on the Altiplano of Bolivia, the bowler hat wearing Aymara women known as Chollas are not typical of the Potosi region. 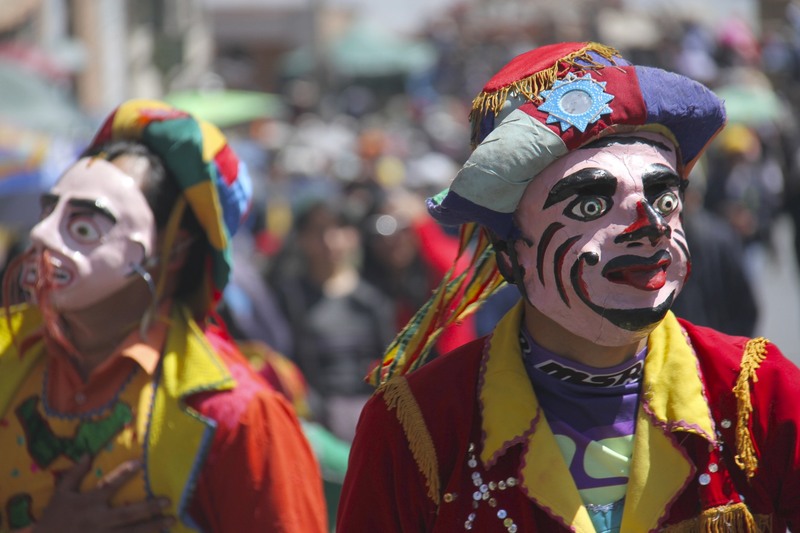 I’d guess this group came from La Paz to perform. 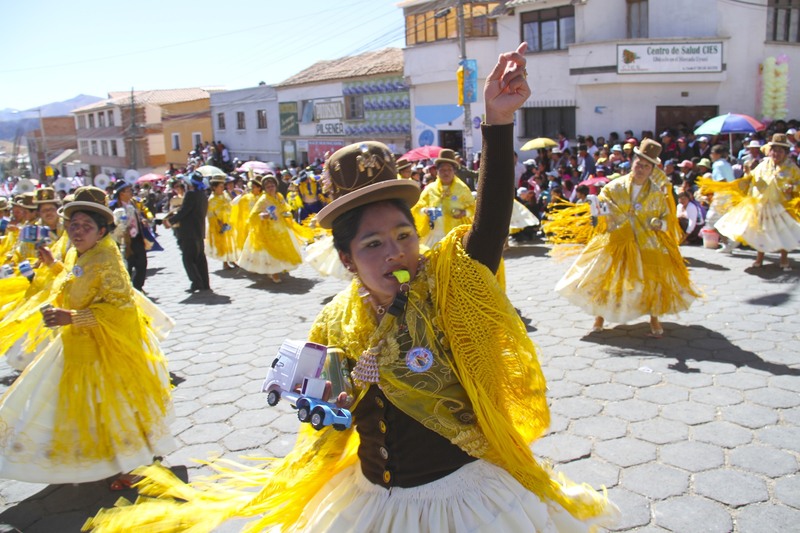 Their rattles are in the shape of trucks, and they’re each grasping a can of Potosina beer, in fact they had two people accompanying them with cases of beer – thirsty work this dancing lark. 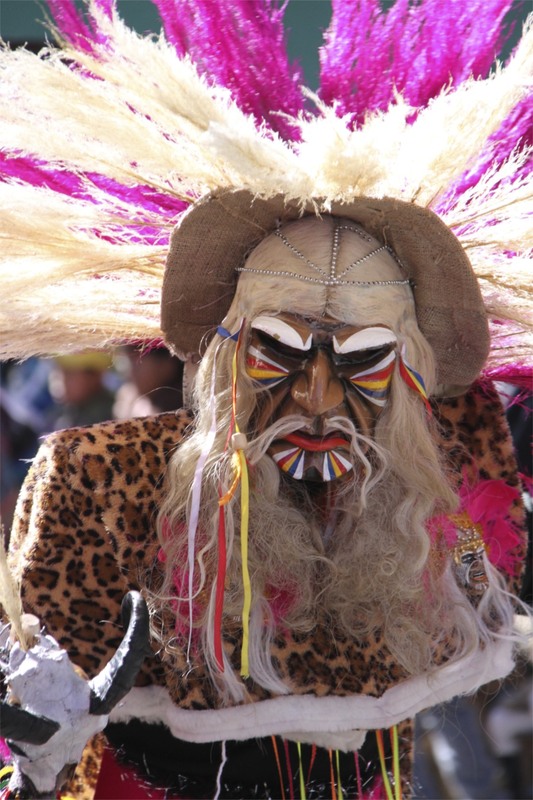 The array of masks at Ch’utillos really was extraordinary – although some came a bit too close to being Gandalf.